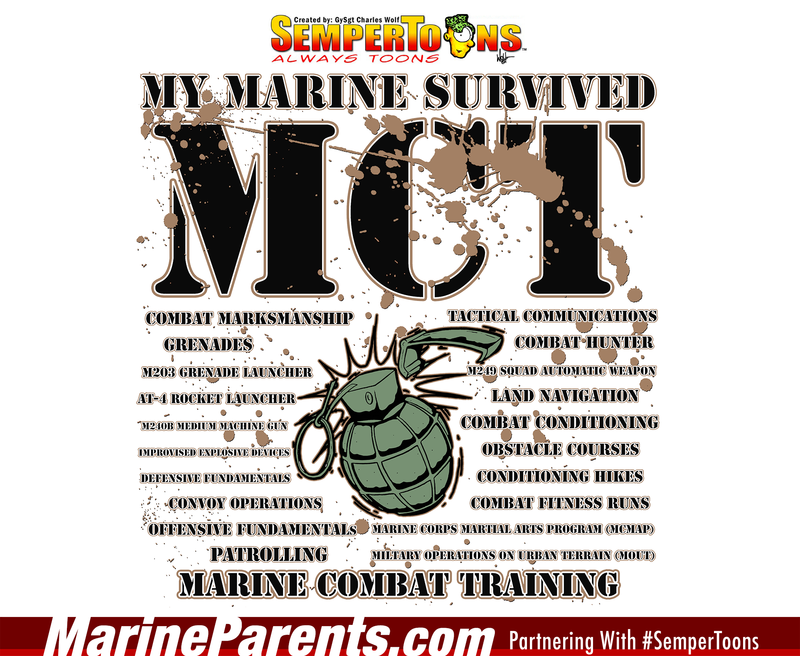 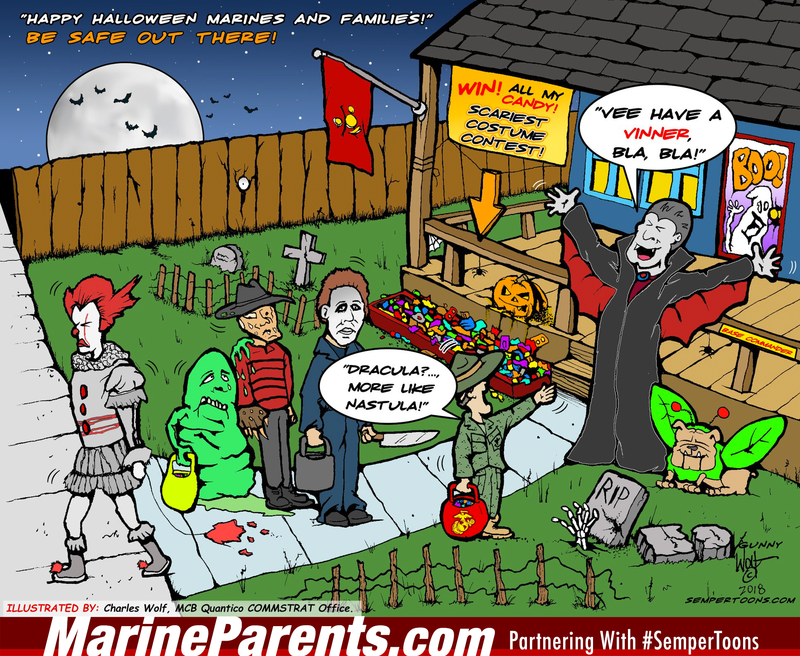 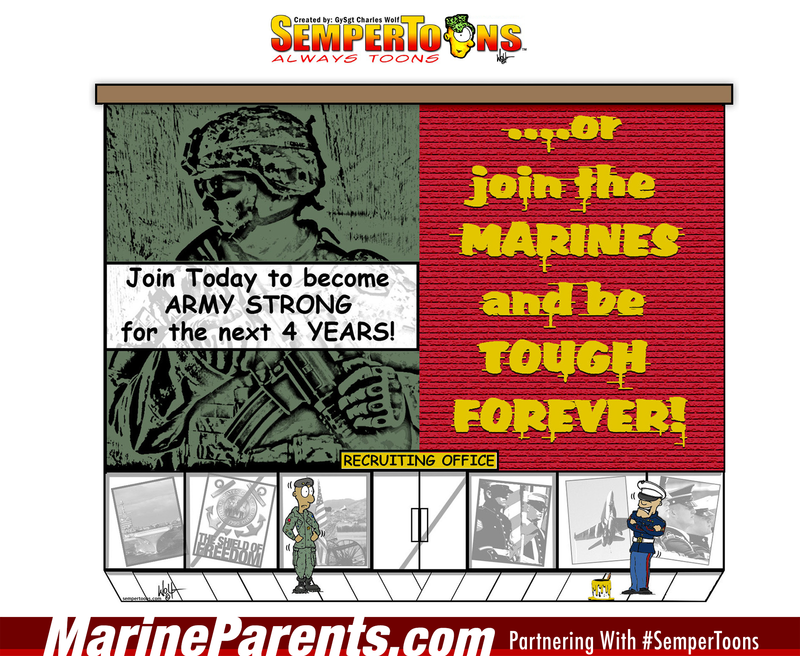 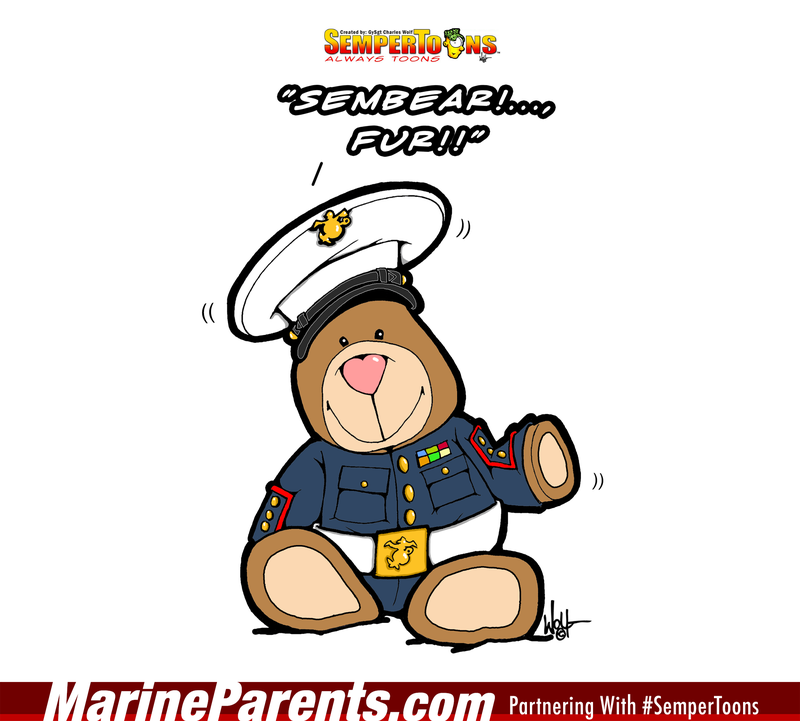 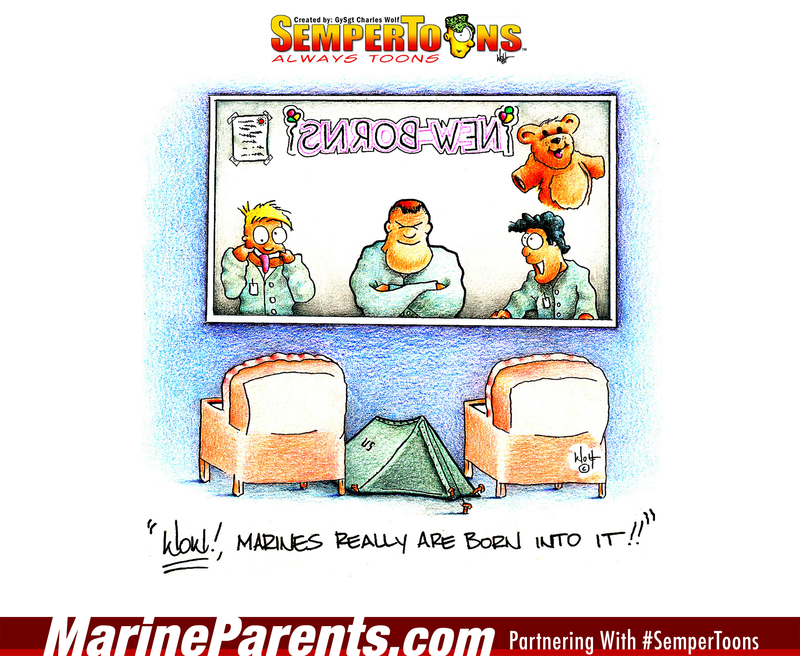 SemperToons brought to you by Gunny Wolf in partnership with MarineParents.com, keeping the family and Marines smiling. 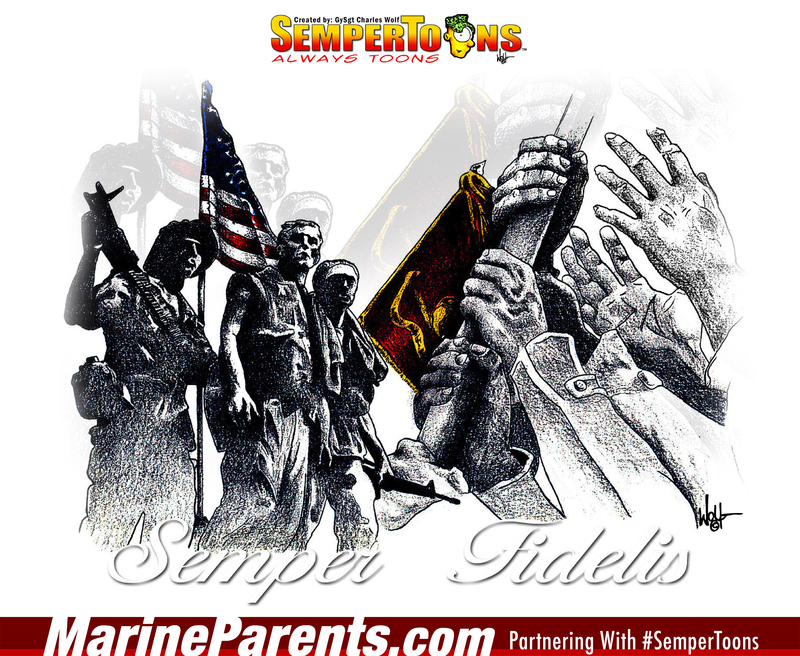 Click here to like SemperToons on Facebook. 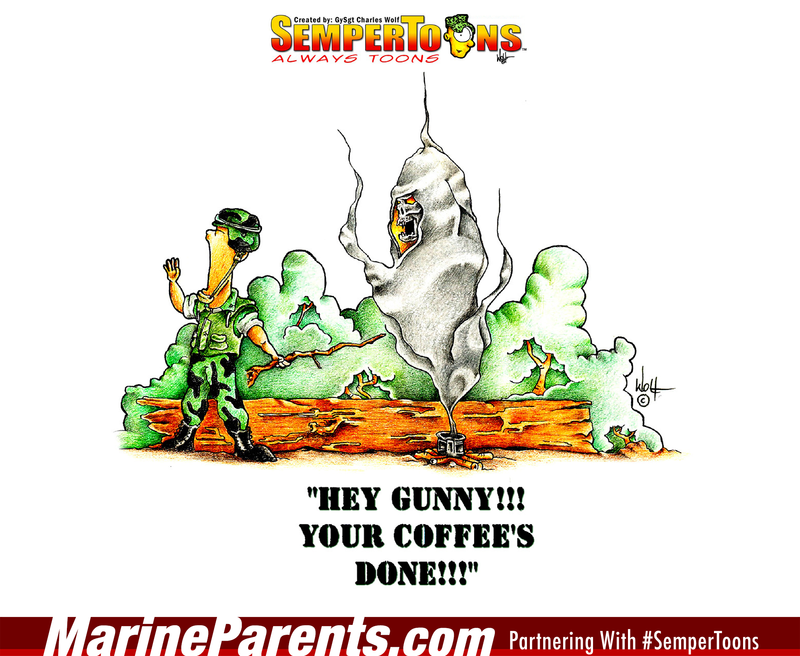 Shop SemperToons products at the EGA Shop. 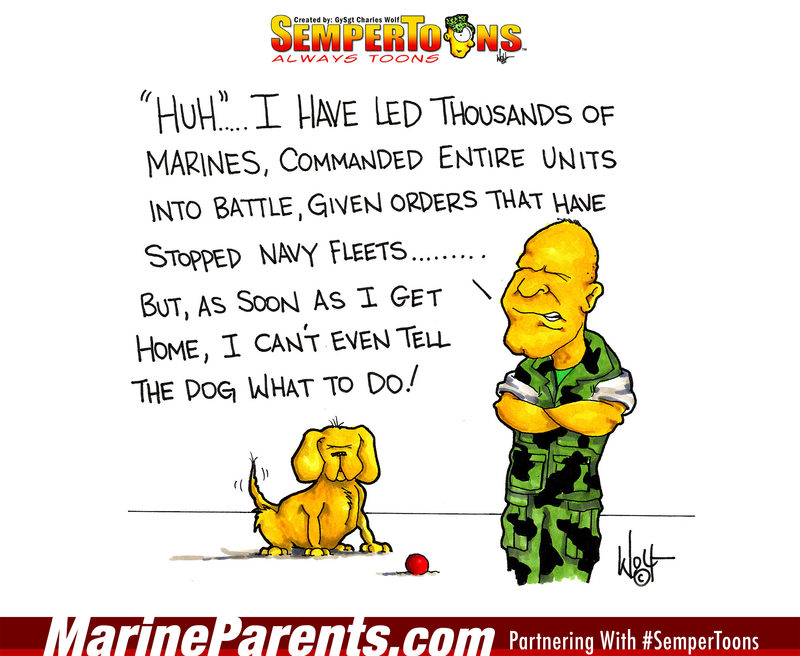 Click to open full page for sharing. 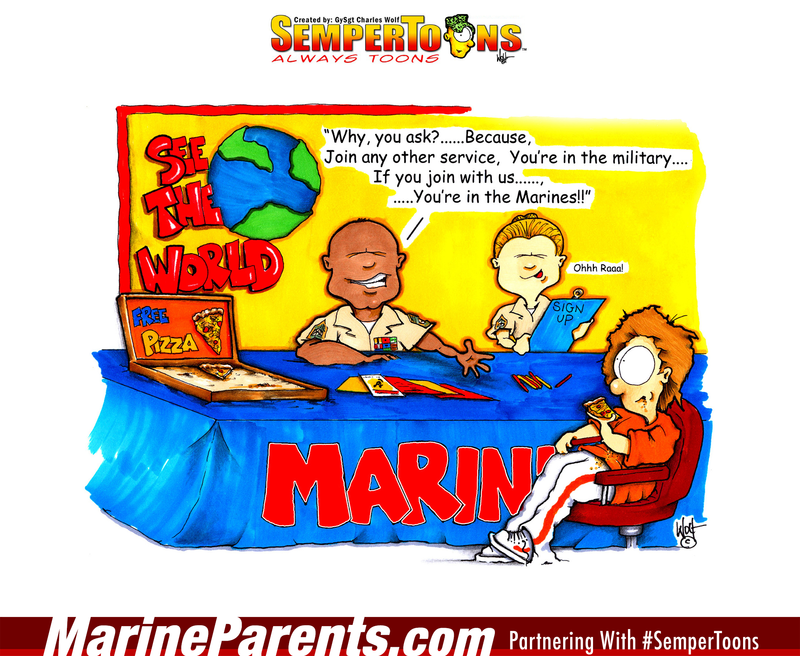 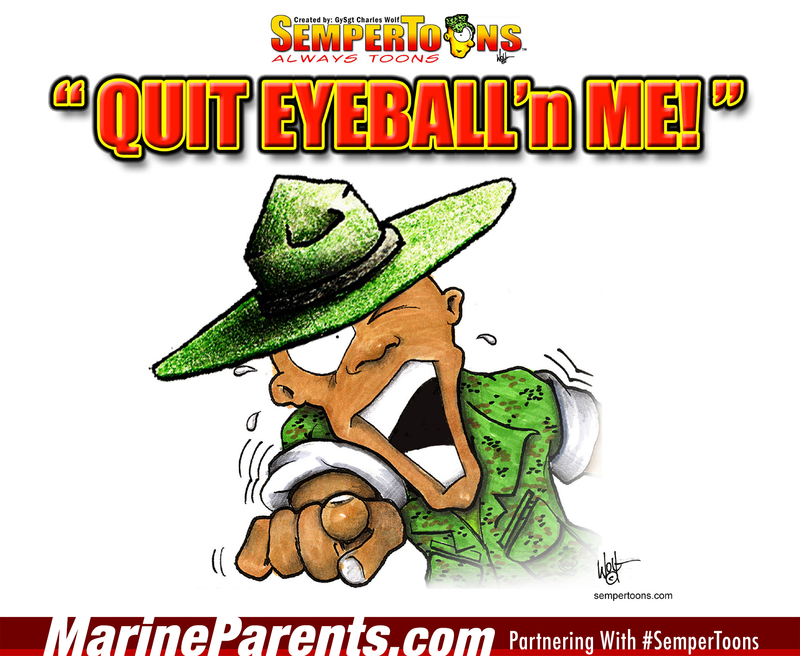 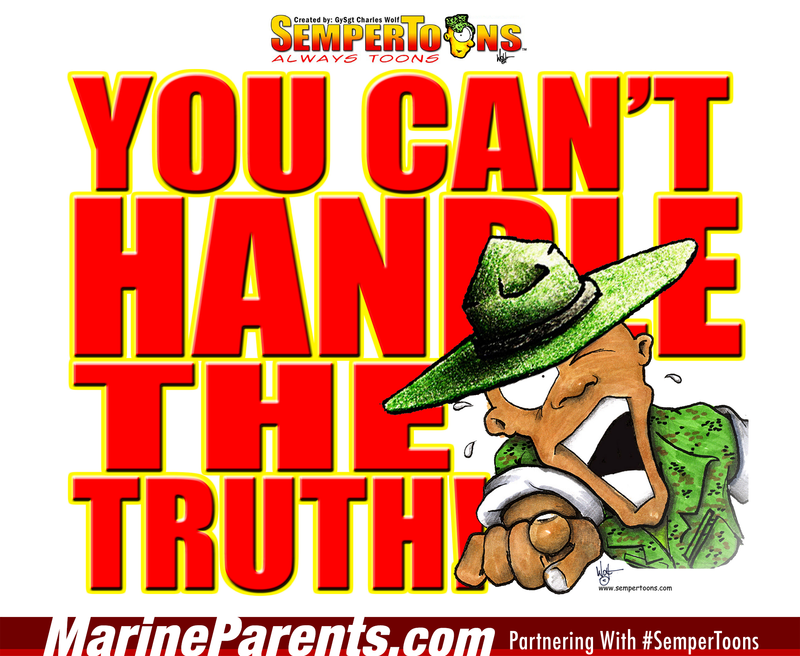 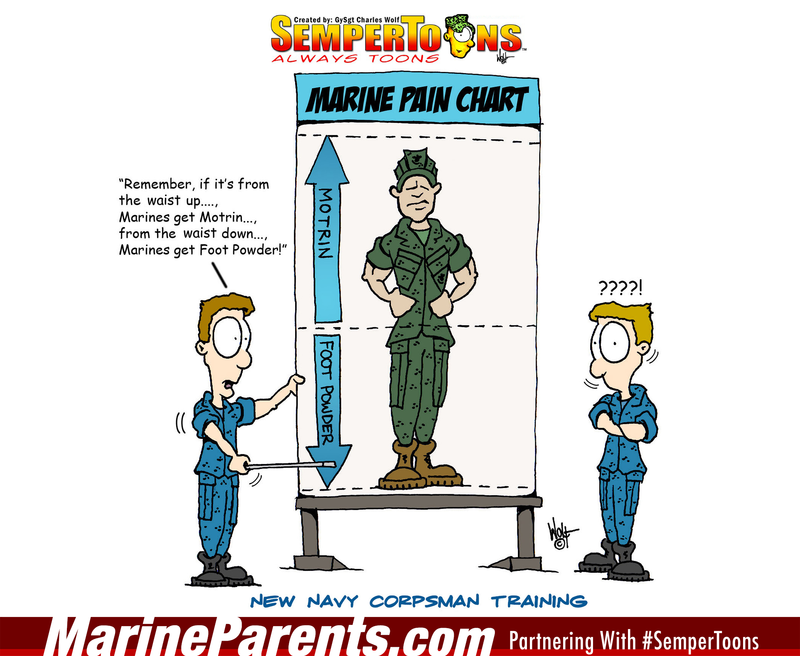 Gunny Wolf from SemperToons has created this cartoon that features a superior Marine saying, "My pain is seeing the weakness in your body!" 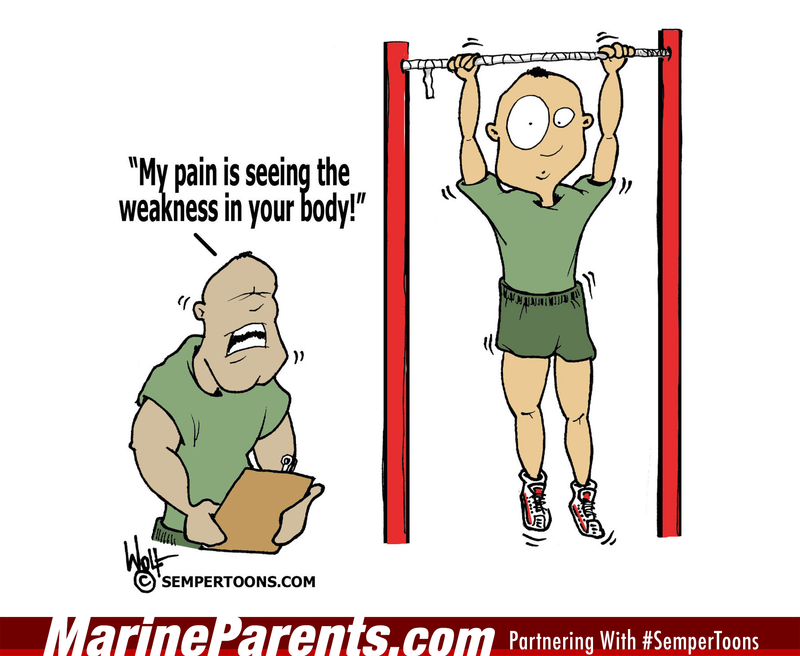 to a Marine trying to do a pull up. 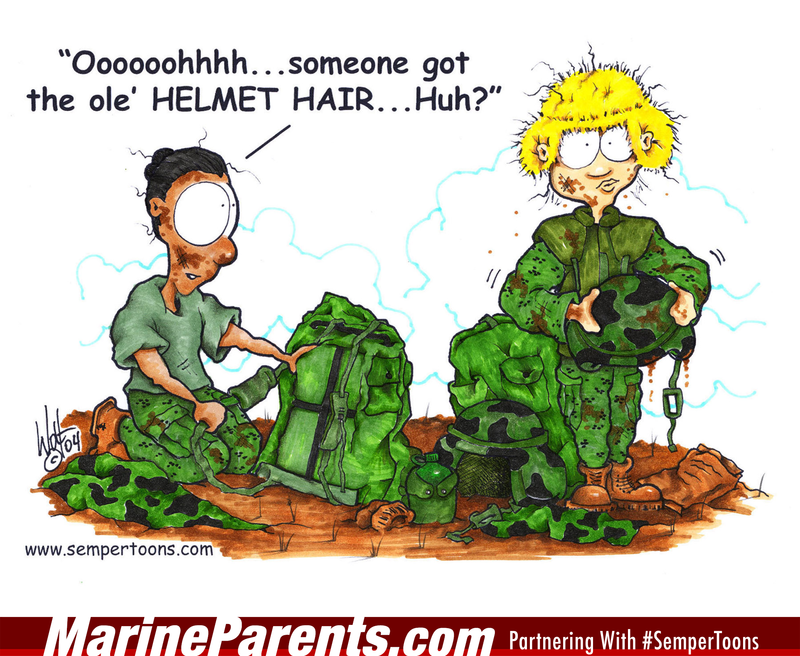 Gunny Wolf from SemperToons has created this cartoon that features a Marine with severe helmet hair after taking off their combat helmet. 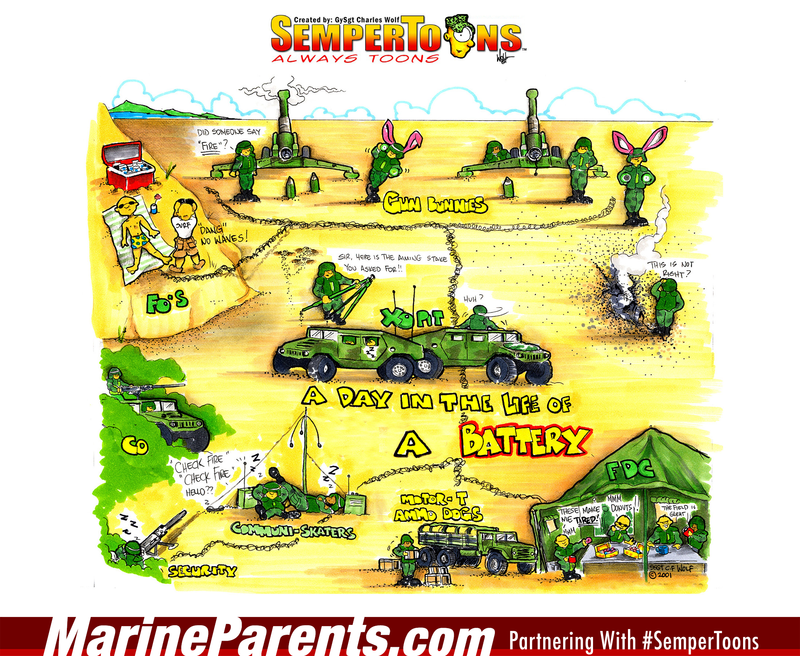 Gunny Wolf from SemperToons has created this cartoon that features a cartoon of a SGT finding a lamp with a genie that grants one wish each to a SGT, SSGT, and Gunny. 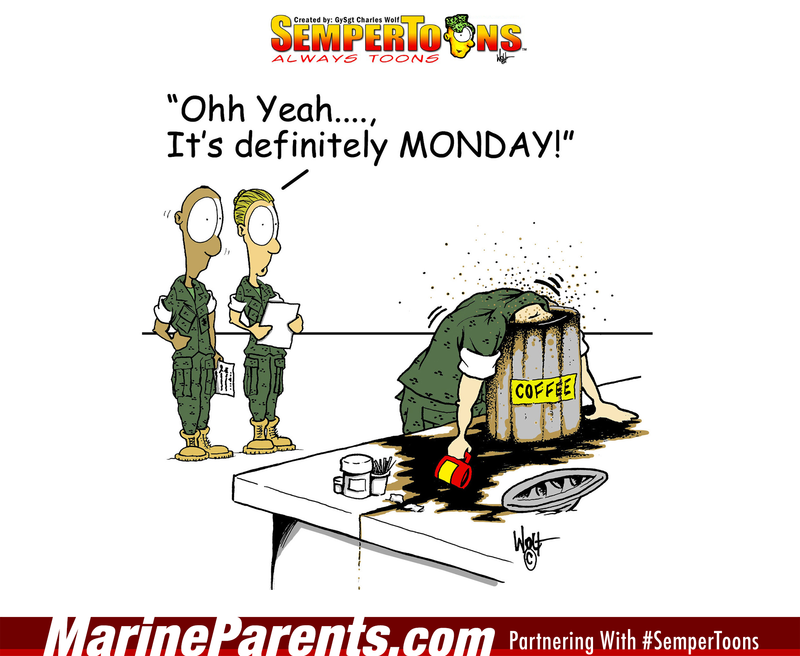 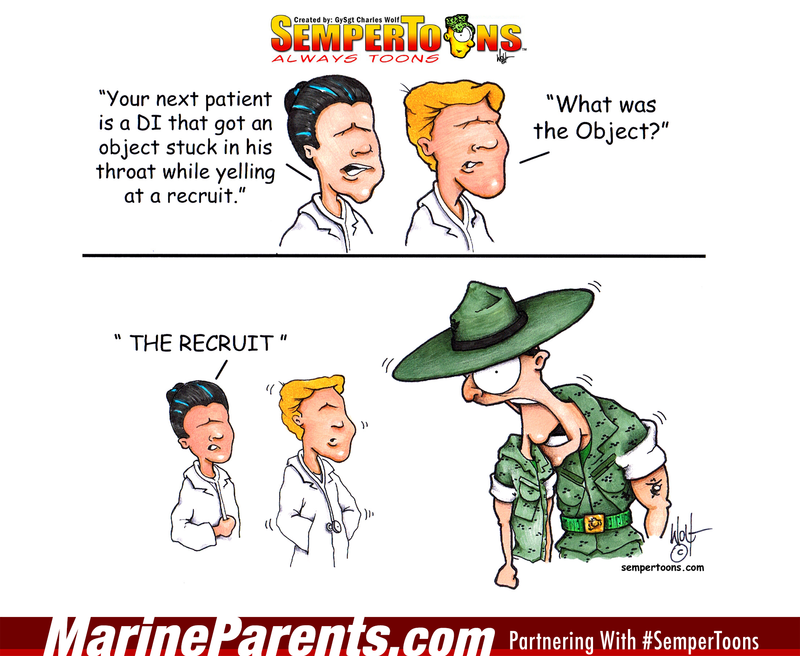 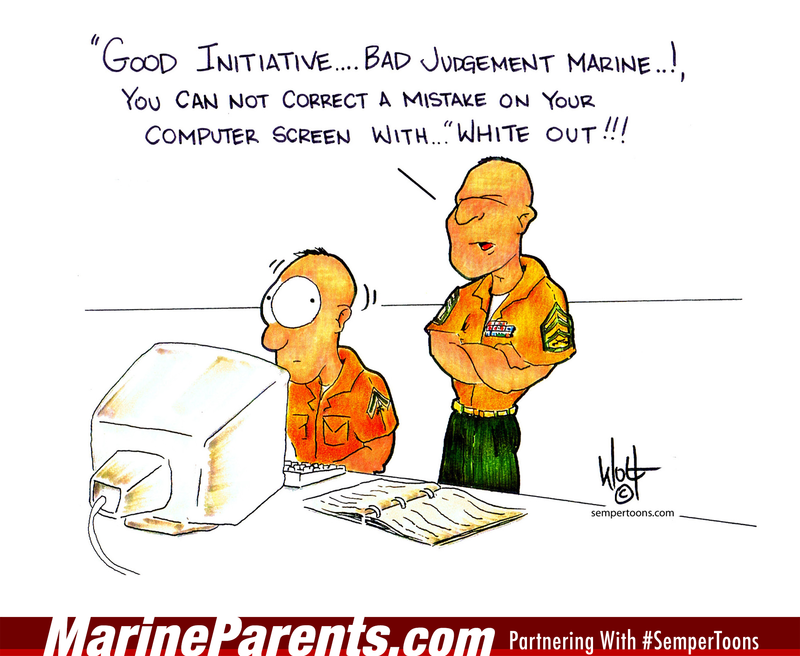 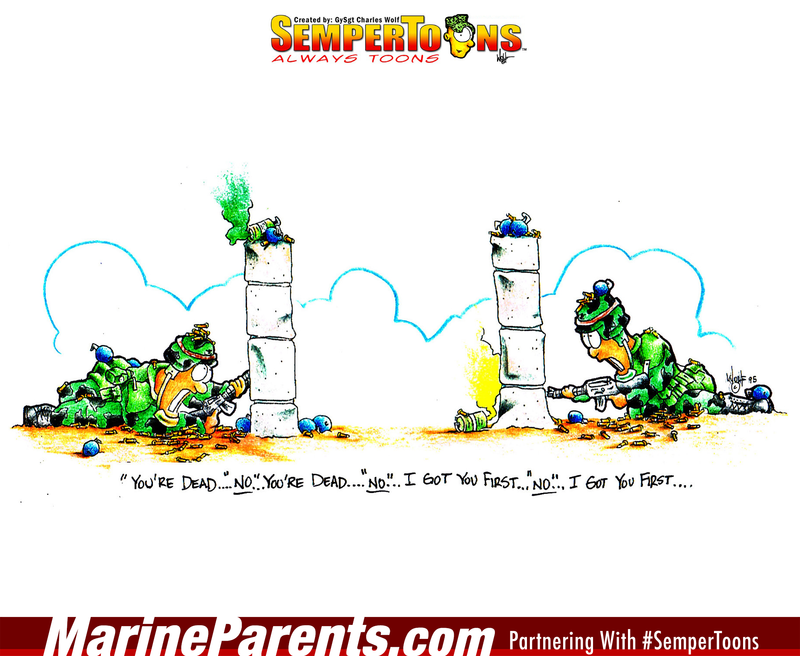 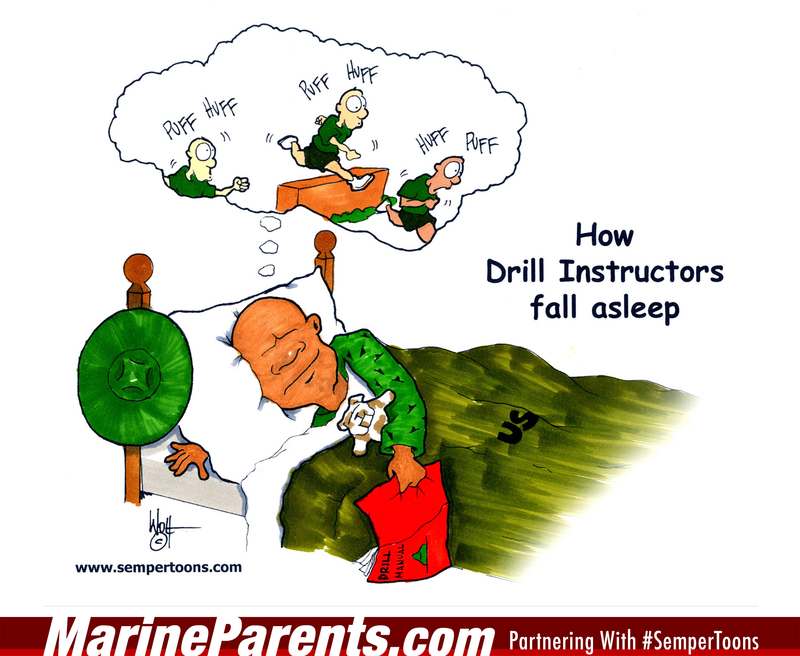 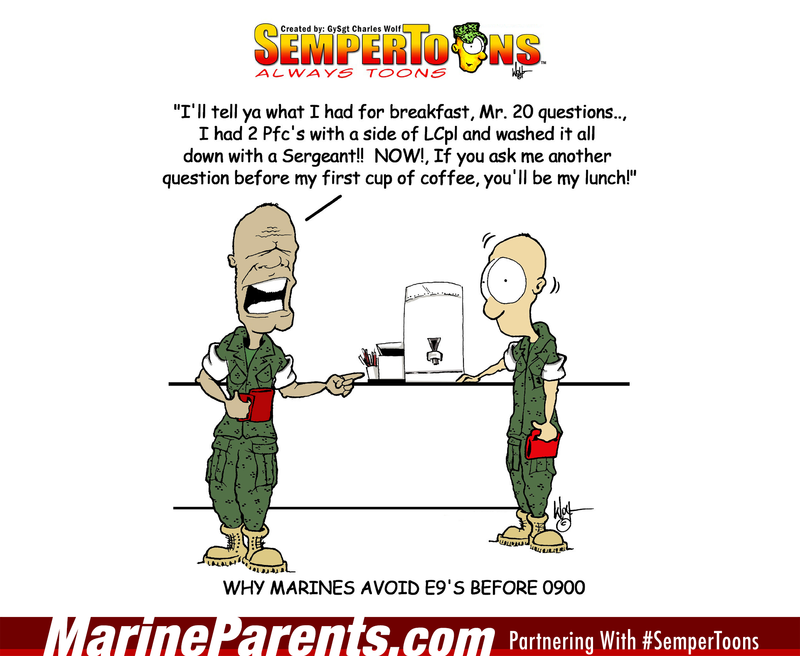 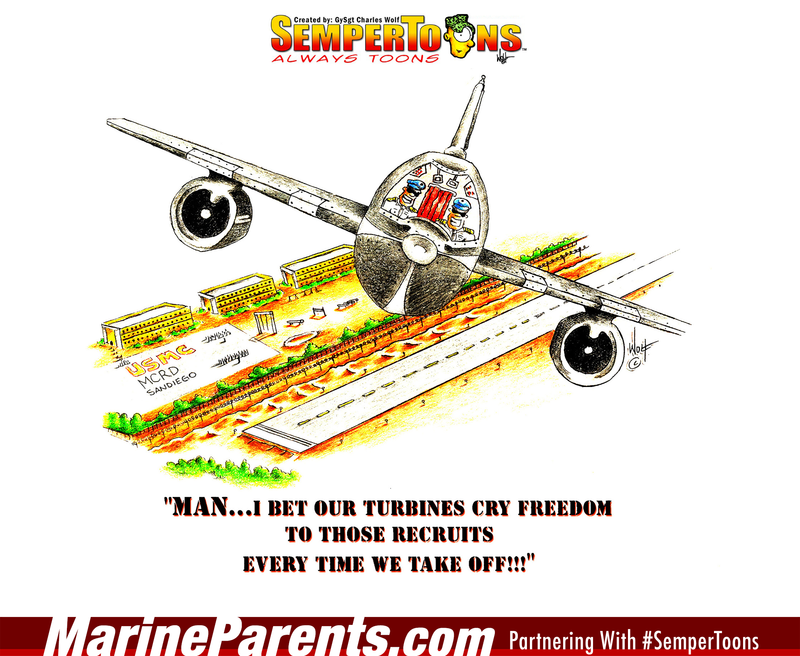 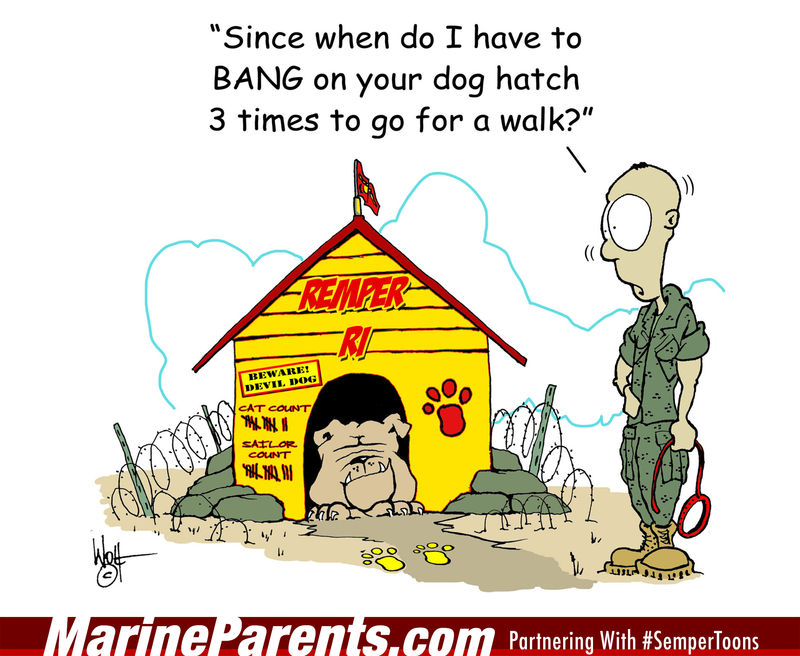 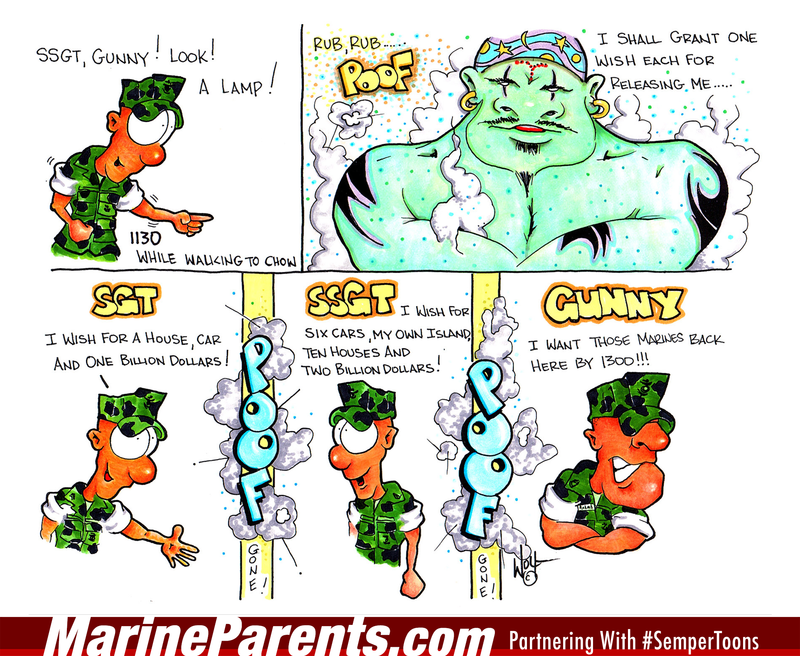 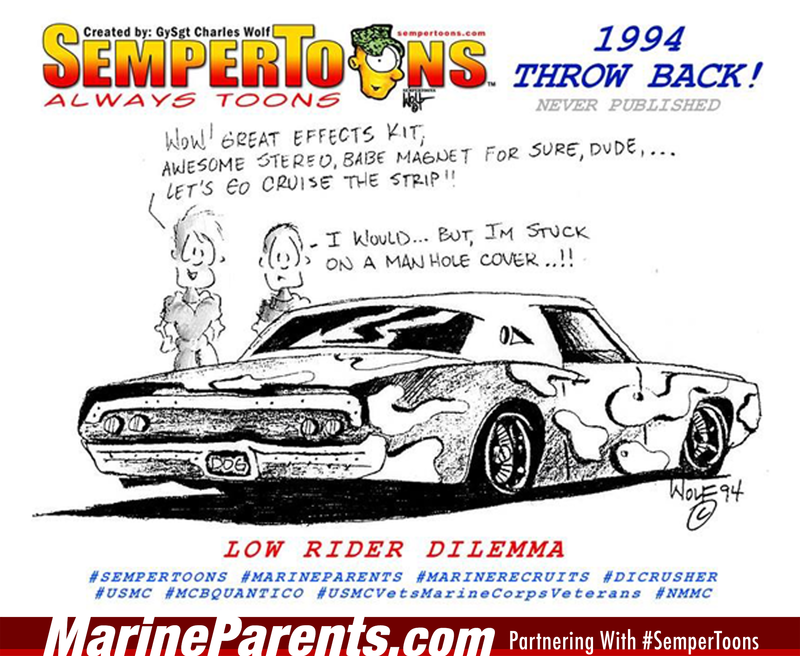 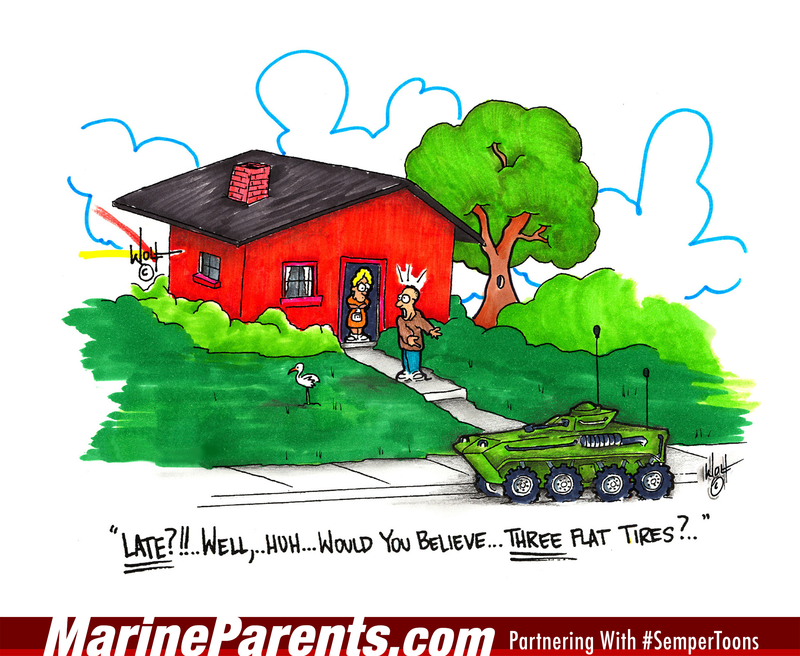 Gunny Wolf from SemperToons has created this cartoon that features a senior Marine making fun of an "03" saying, "Hah! 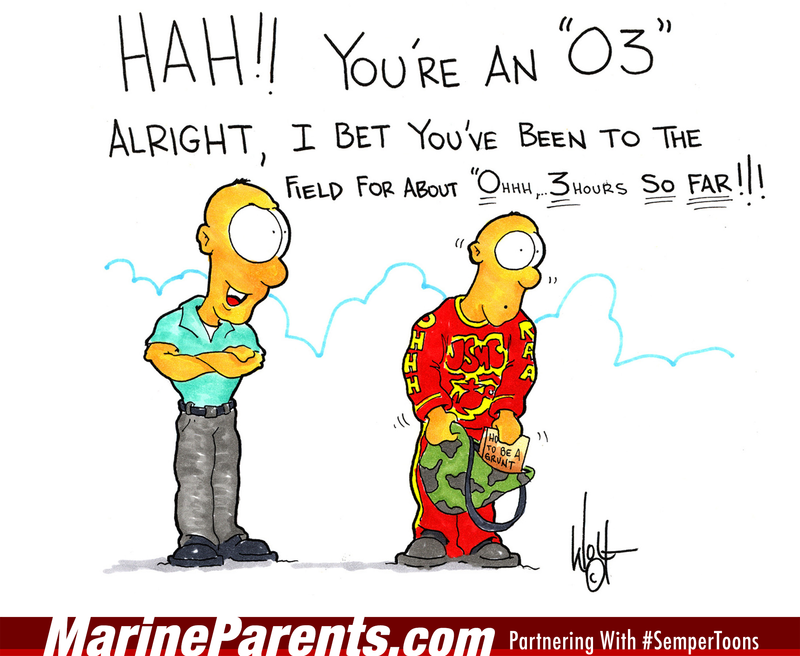 You're an 03, Alright I bet you've been in the field for about Ohhh, 3 hours so far!" 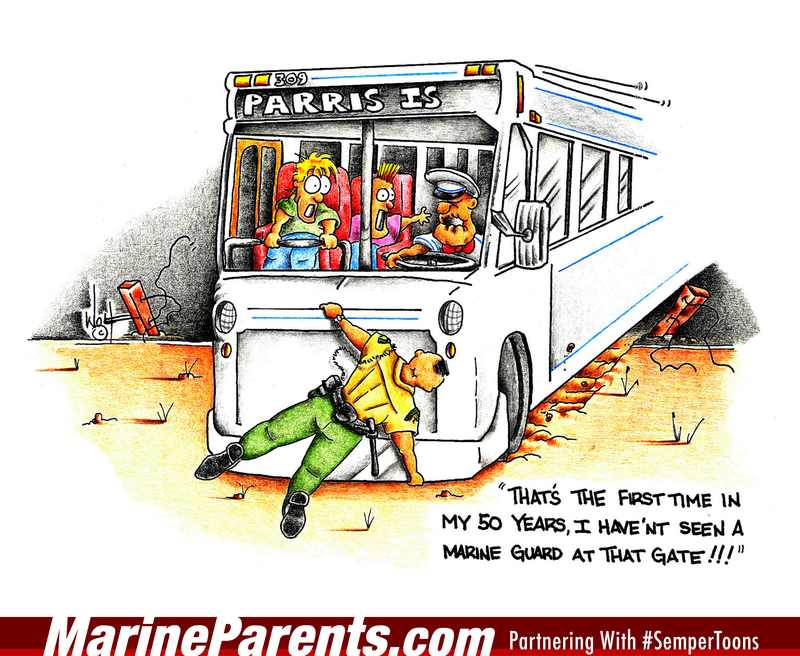 Gunny Wolf from SemperToons has created this cartoon that features a female Marine writing to her mother as her D.I. 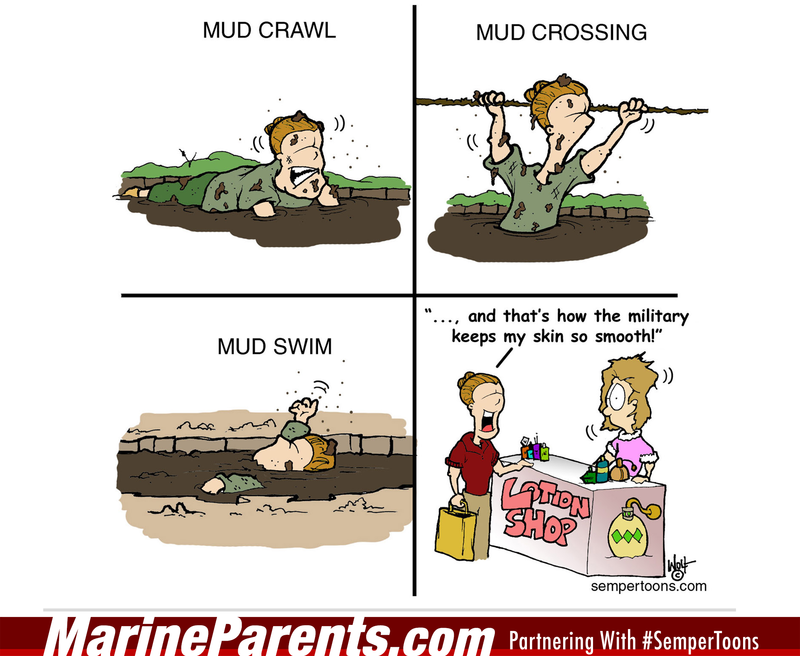 stands a little ways off. 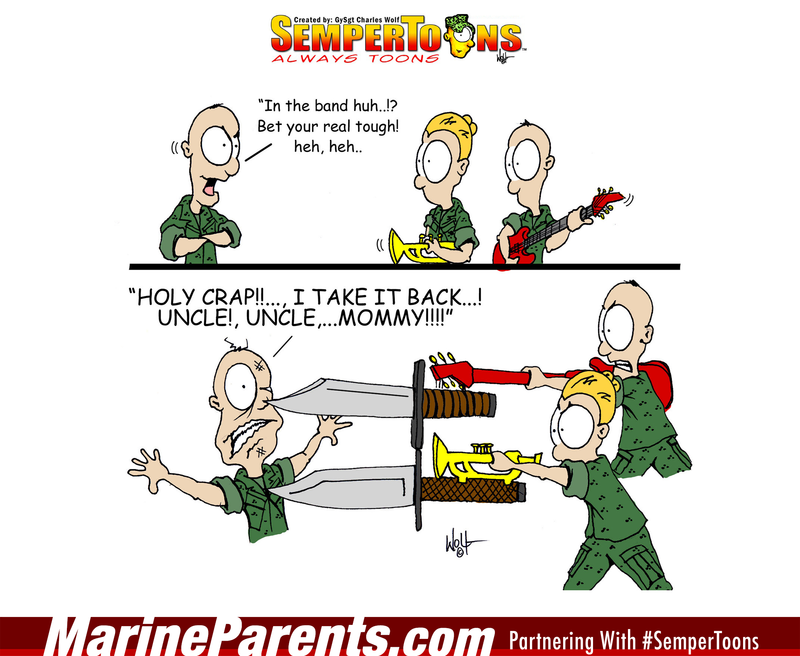 She writes to her mother, "P.S. 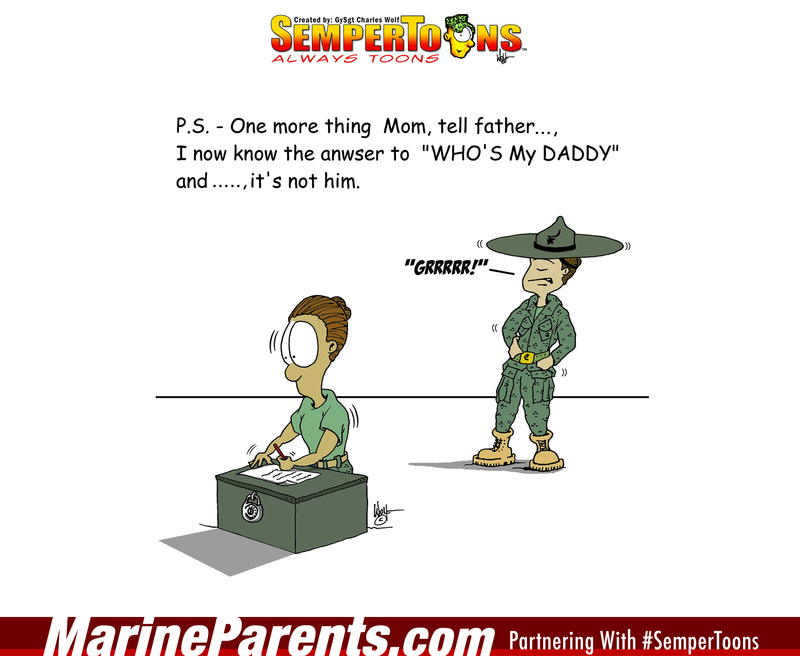 One more thing, Mom...tell Father I now know the answer to 'Who's my daddy"...and it's not him!" 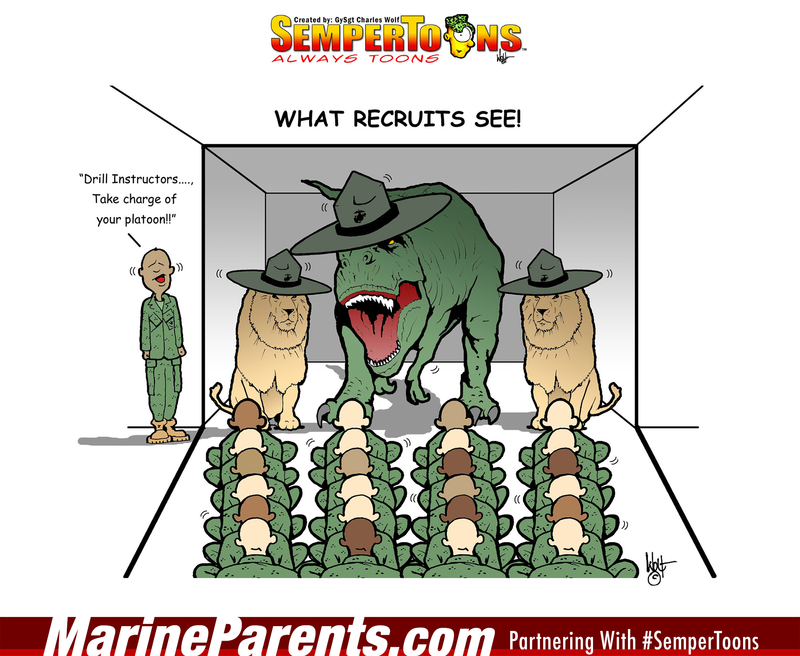 Gunny Wolf from SemperToons has created this cartoon that features new recruits sitting in front of their DIs that look like lions and a dinosaur. 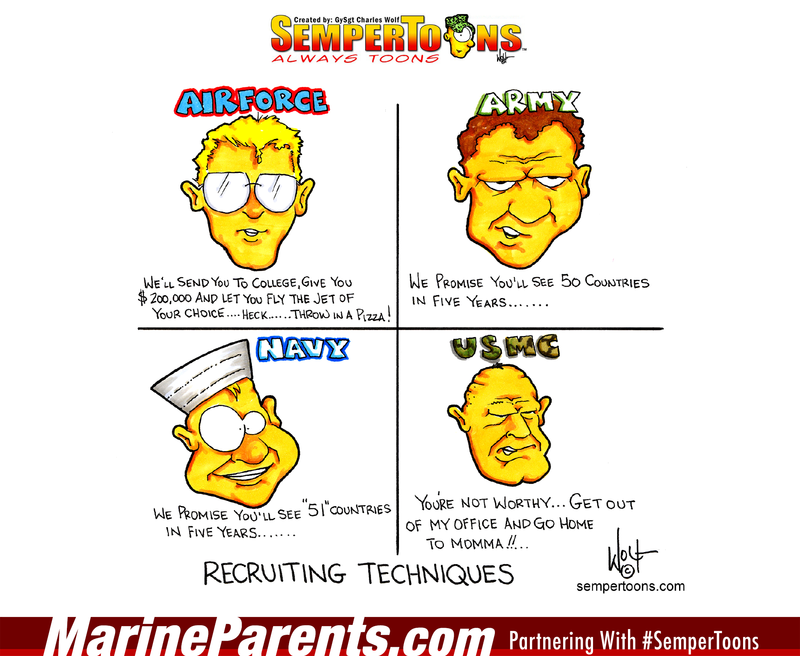 Gunny Wolf from SemperToons has created this cartoon that features the "recruiting techniques" of each branch of the service. 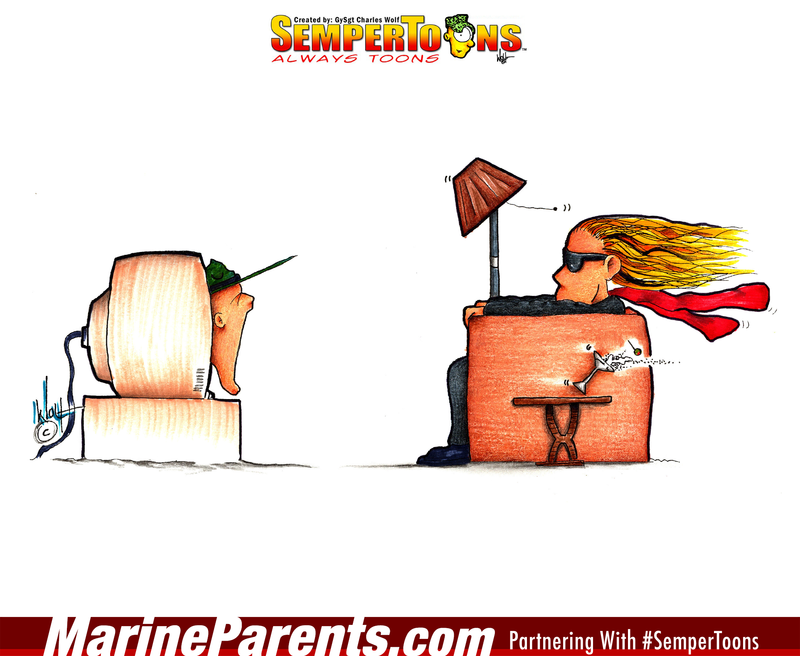 Gunny Wolf from SemperToons has created this cartoon that reads "At ease Superman! 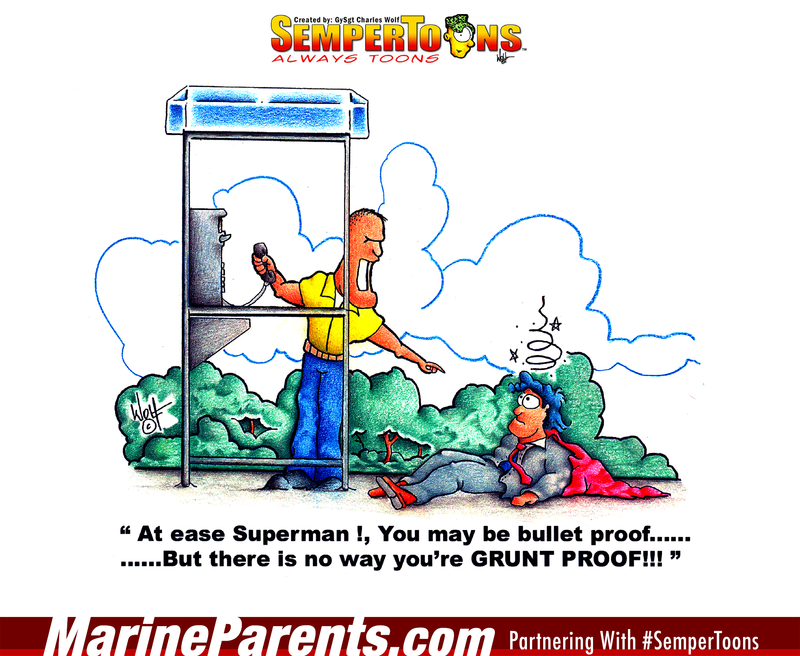 You may be bullet proof... 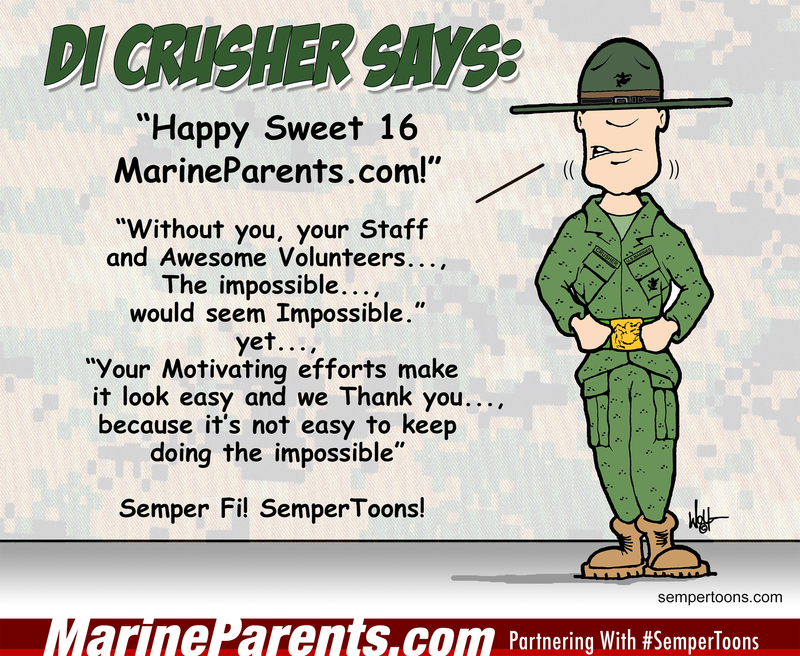 But there is no way you're GRUNT PROOF!!!" 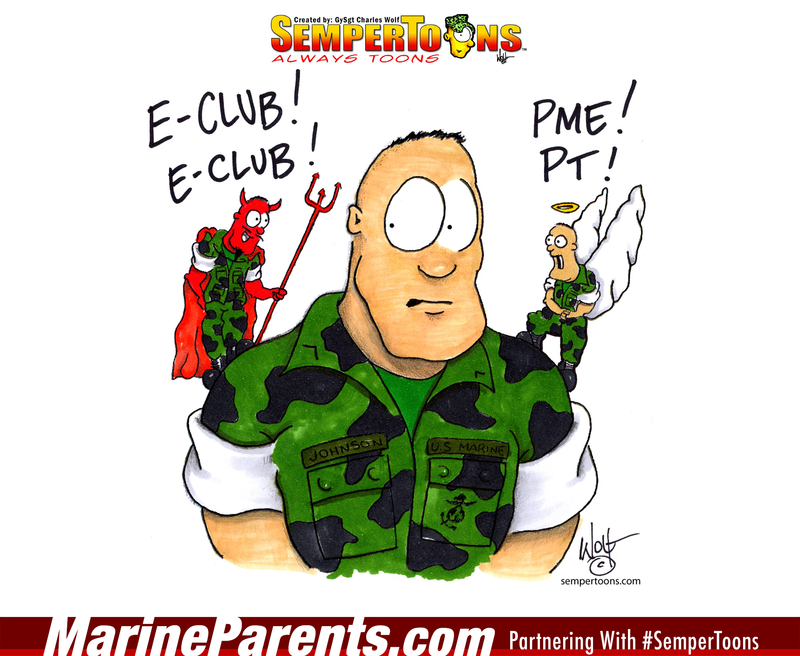 Gunny Wolf from SemperToons has created this cartoon that features a Marine with a devil Marine and an angel Marine on each shoulder. 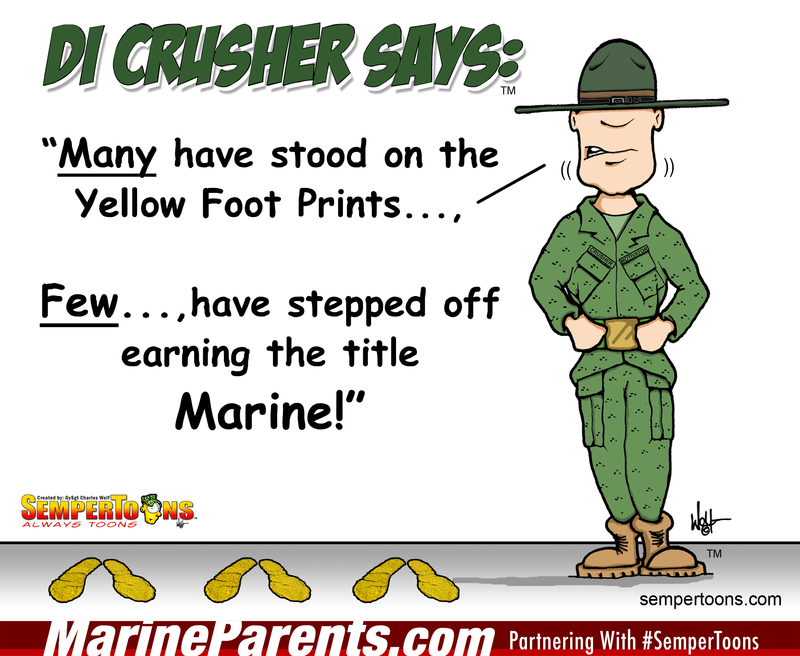 Gunny Wolf from SemperToons has created this cartoon that features a DI saying "Many have stood on the yellow foot prints... FEW have stepped off earning the title Marine!" 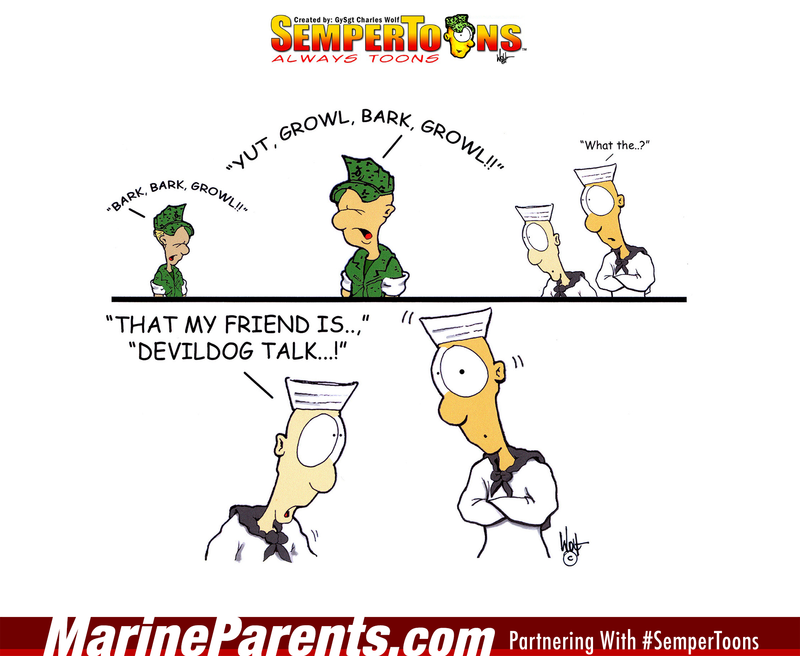 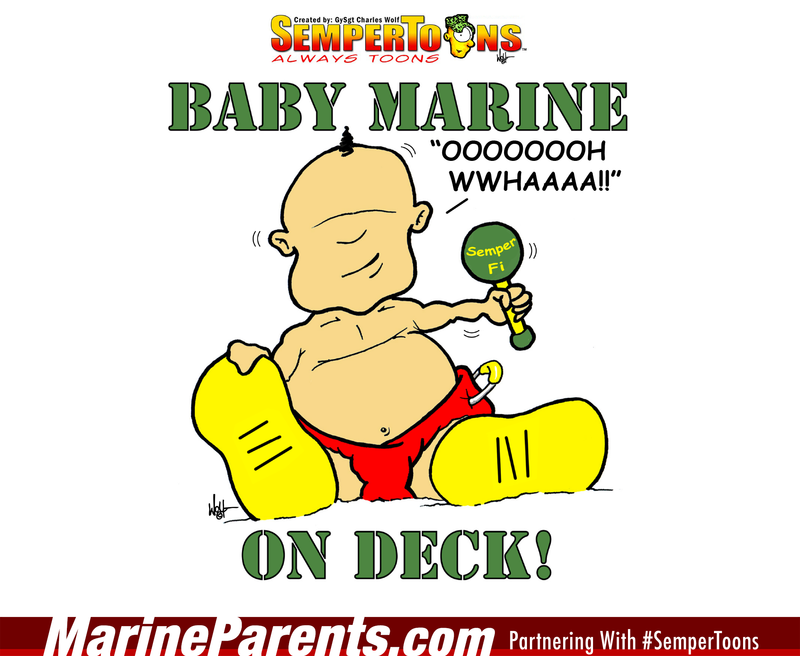 Gunny Wolf from SemperToons has created this cartoon that features a baby saying "OOH WHAA" a play on the Marine's "OOH RAH"
Gunny Wolf from SemperToons has created this cartoon that features Marines talking to eachother with "barks" while Sailors listen in and say "That my friend is devildog talk!" 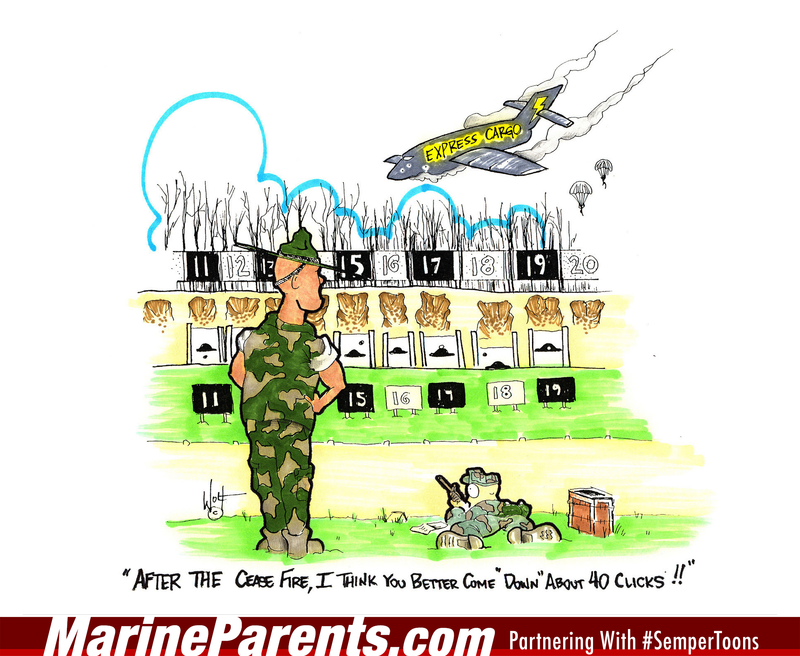 Gunny Wolf from SemperToons has created this cartoon that features a Marine sitting at his desk with various trophies and accolaides on the wall. 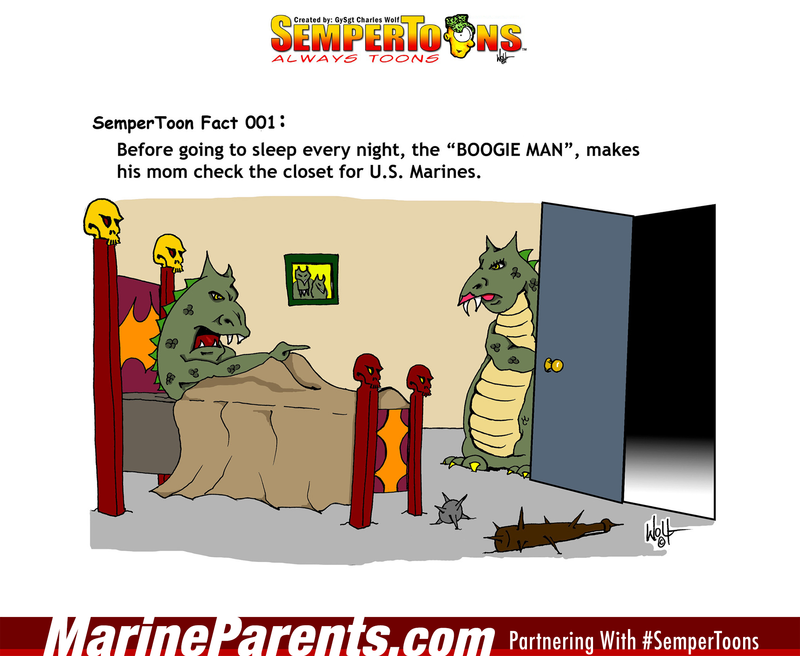 In the right hand corner is a Marine D.I. 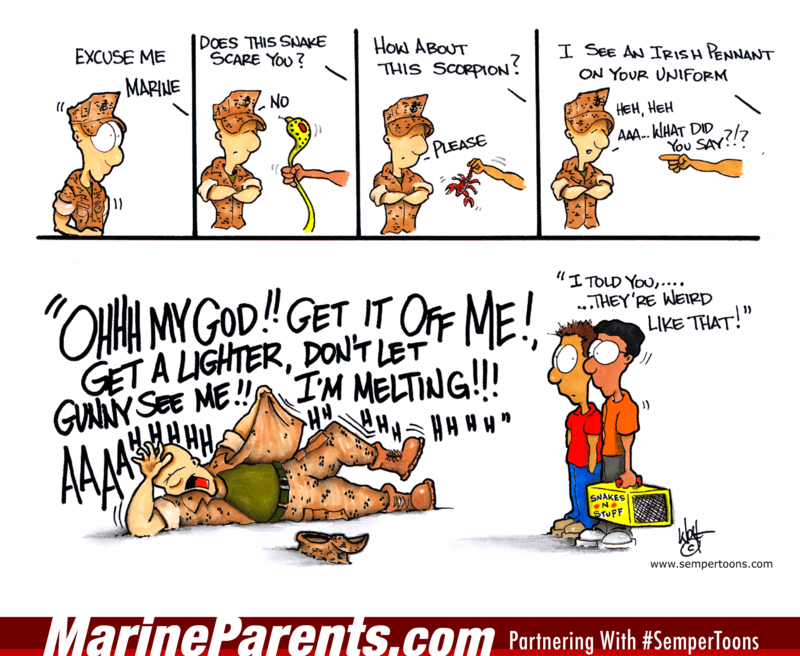 in gear and cap encased in glass. 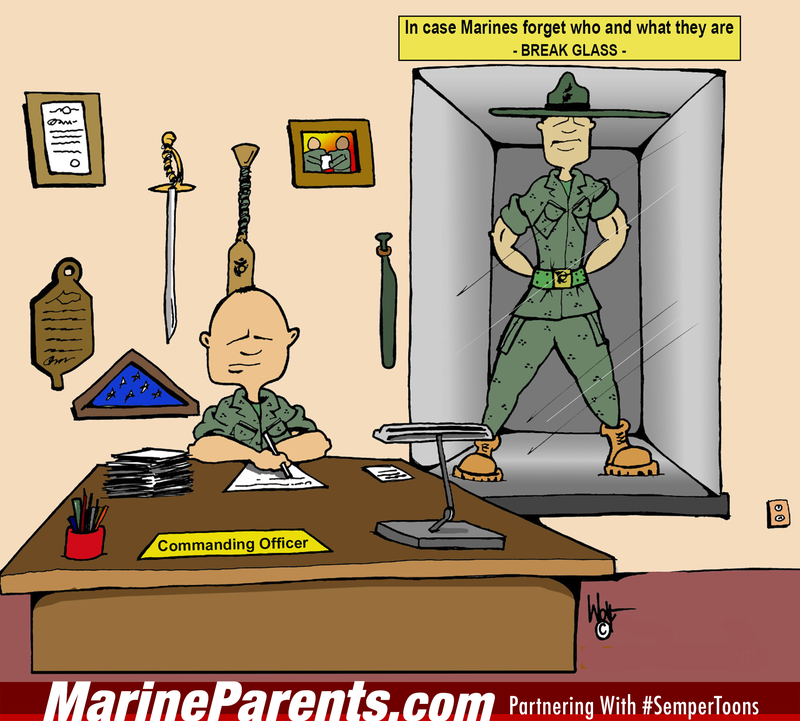 Above the case is a sign that says, "In case Marines forget who and what they are - BREAK GLASS - ". 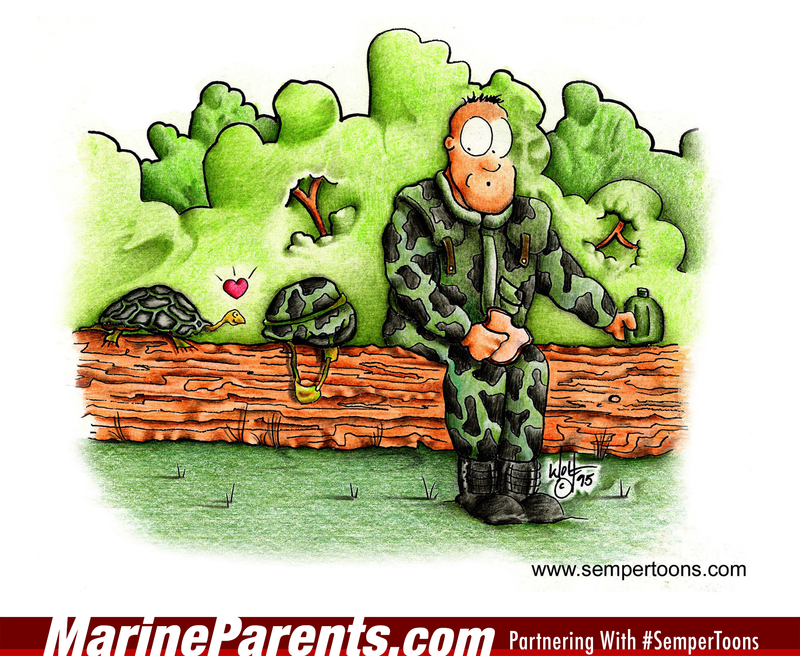 Gunny Wolf from SemperToons has created this cartoon that features a male Marine recruit writing a letter to his mother as his D.I. 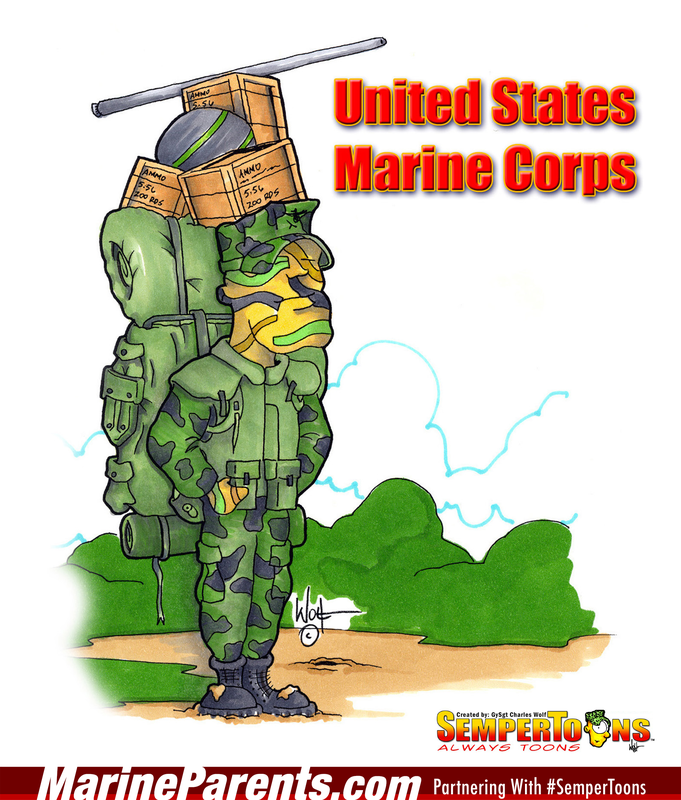 stands over his shoulder. 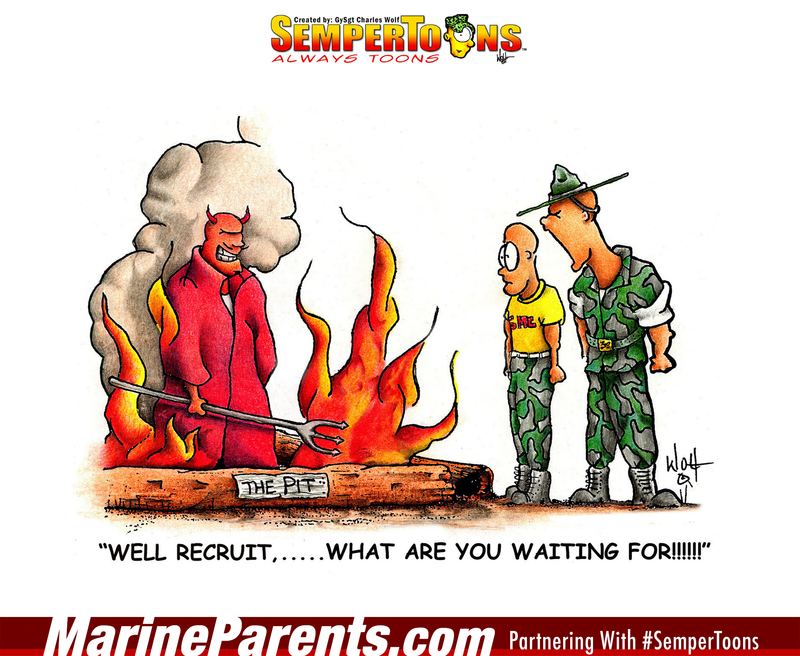 The recruit writes, "Dear Mom, I have good news and bad news. 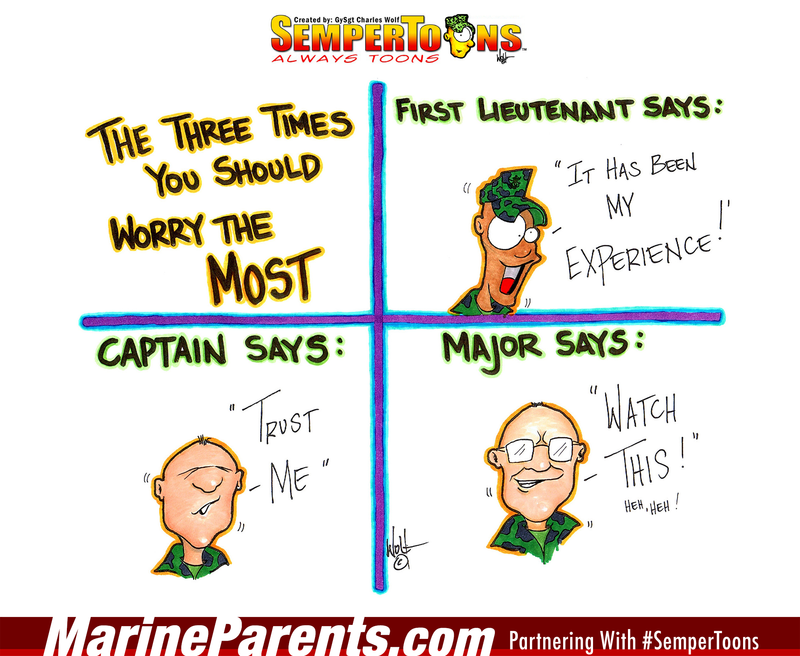 The good news is I'm fine! 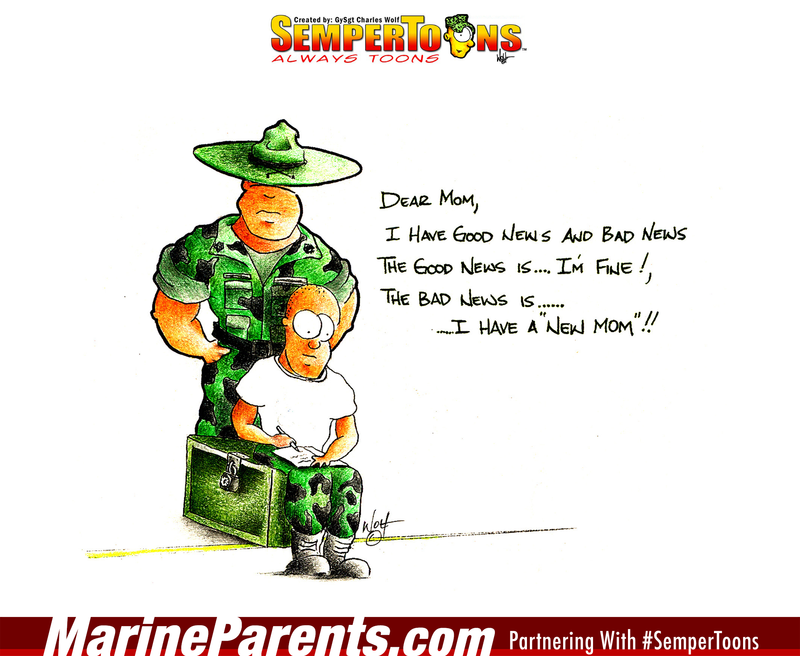 The bad news is...I have a new mom!" 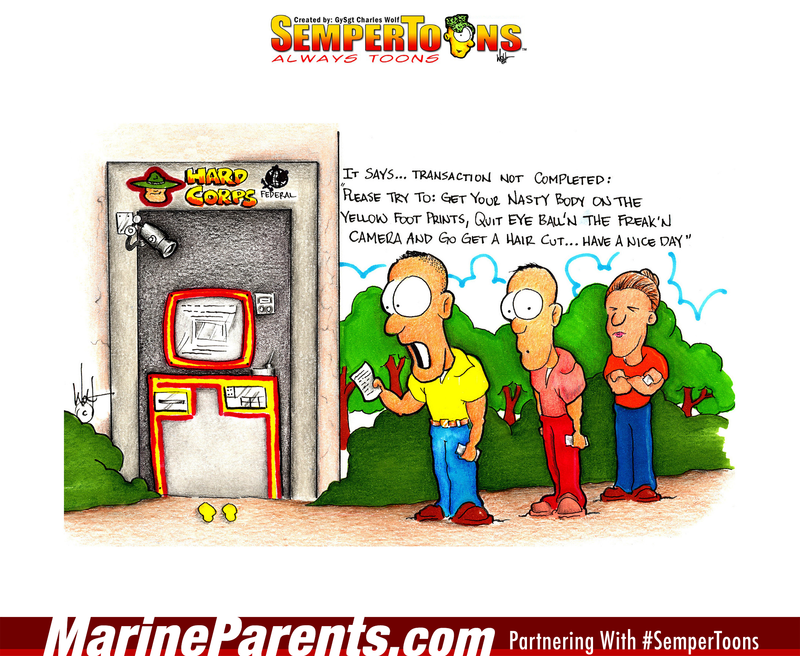 Gunny Wolf from SemperToons has created this cartoon that features a comical scene between two Marines playing paintball while hiding behind barriers, and claiming who shot who first. 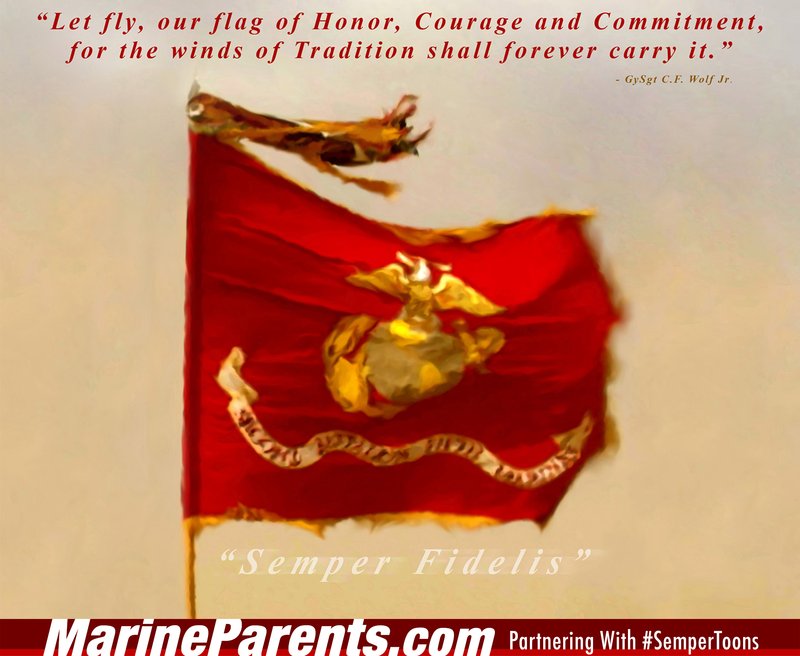 Gunny Wolf from SemperToons has created this cartoon that features the Marine flag whipping in the wind, along with quote on top by GySgt Charles J. Wolf Jr., "Let fly, our flag of Honor, Courage, and Commitment, for the winds of Tradition shall forever carry it". 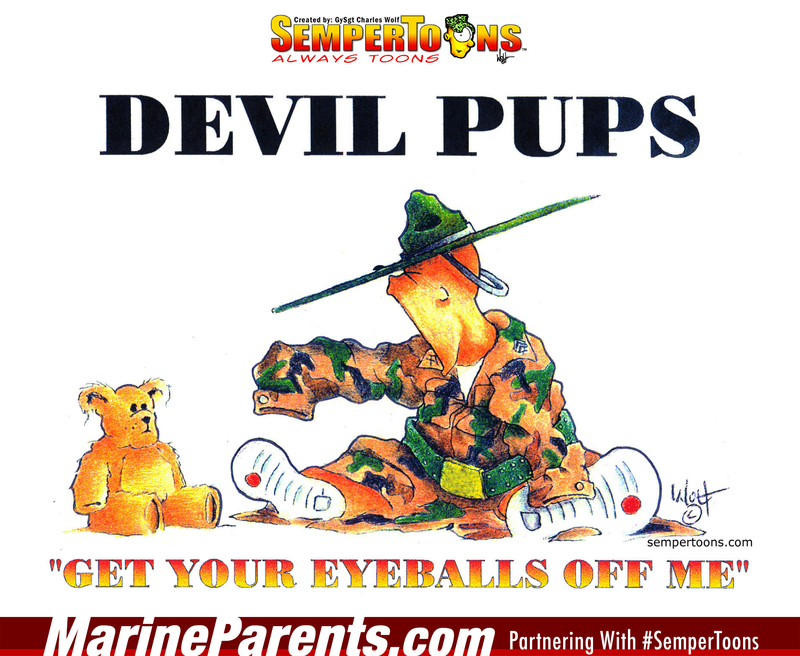 Words "Semper Fidelis" sit below in white script font. 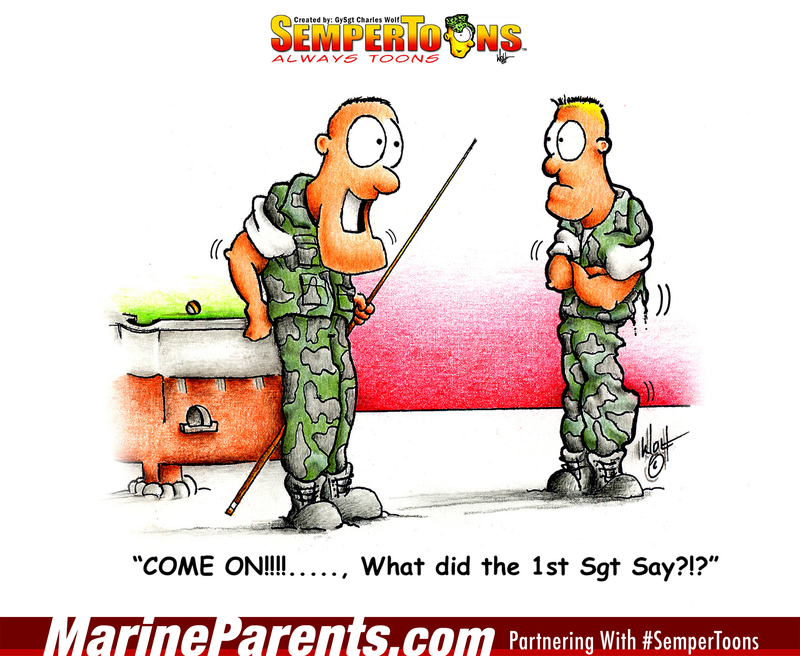 Gunny Wolf from SemperToons has created this cartoon that features one Marine saying "Come on, what did the First Sgt Say?" 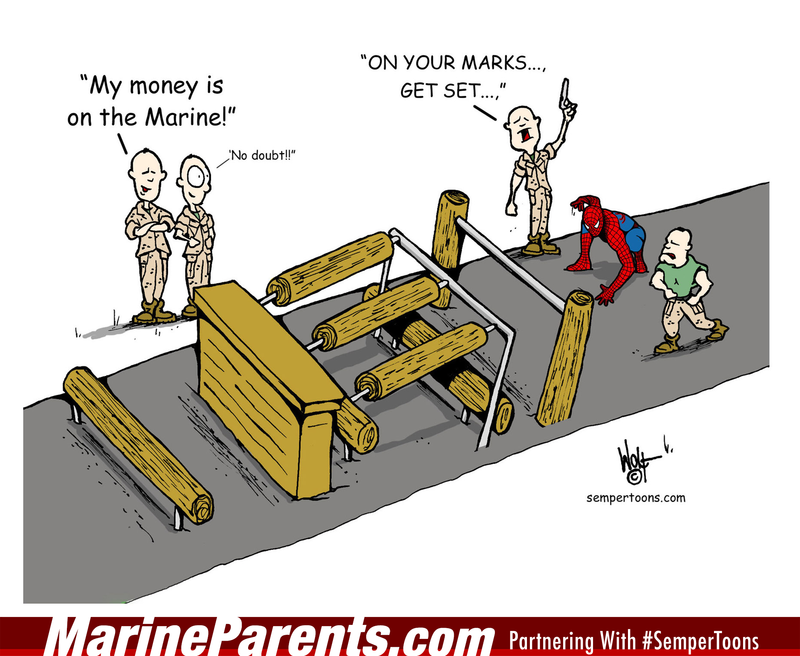 to another Marine. 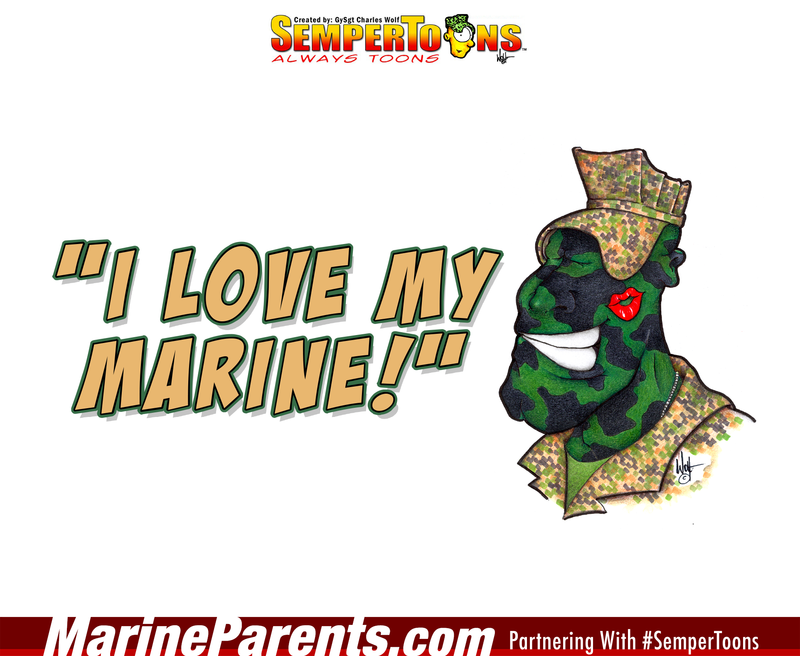 Gunny Wolf from SemperToons has created this cartoon that features a Marine with a lipstick kiss and the text "I Love My Marine". 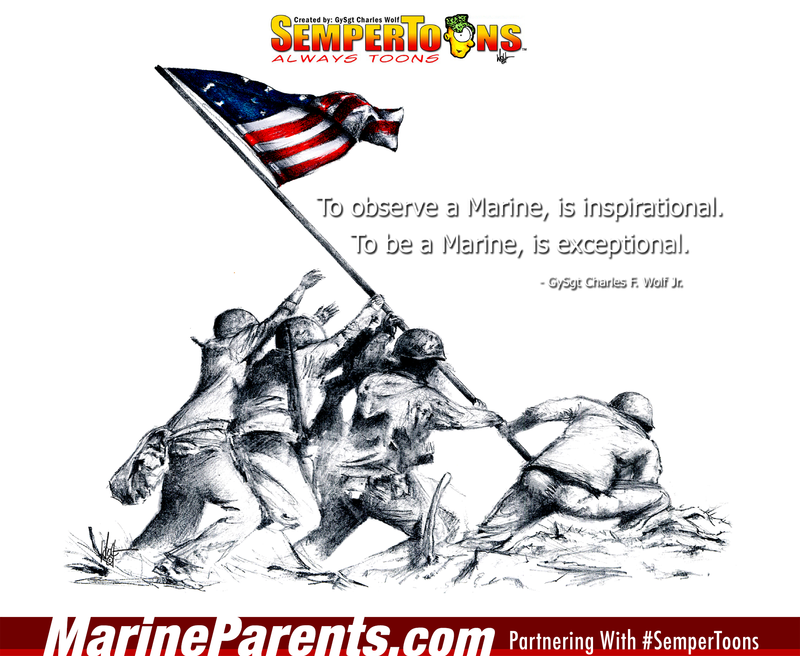 Gunny Wolf from SemperToons has created this cartoon that features famous Iwo Jima image with quote by GySgt Charles J. Wolf Jr., "To observe a Marine is inspirational. 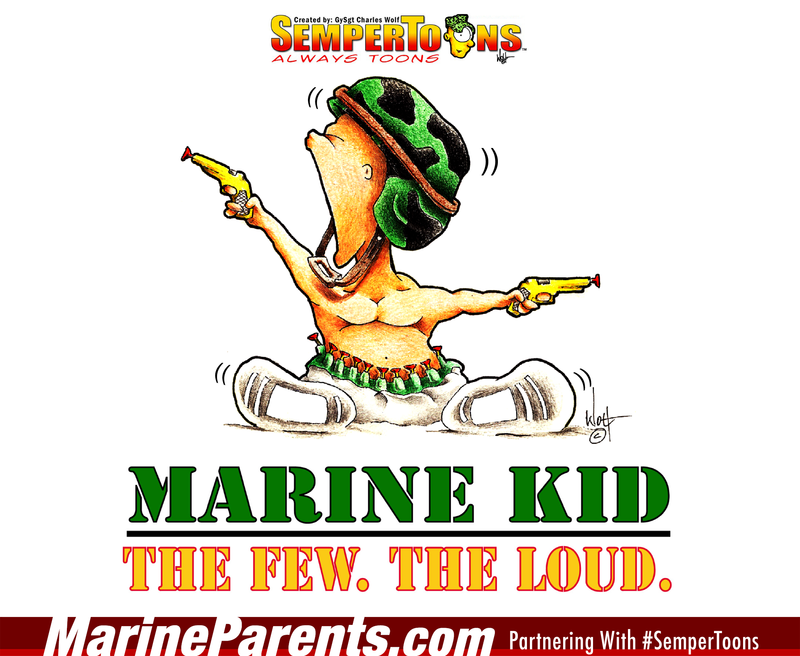 To be a Marine is exceptional." 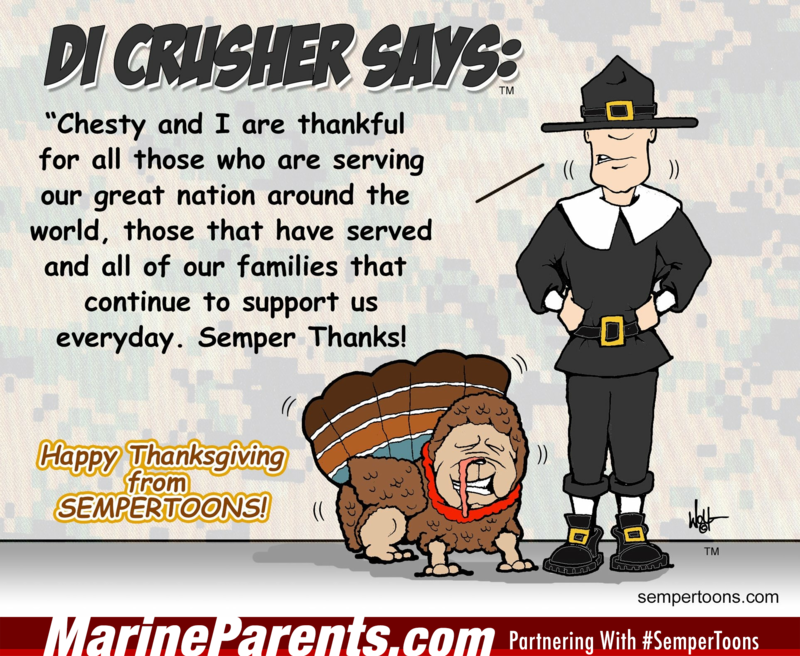 "Chesty and I are thankful for all those who are serving our great nation around the world, those that have served and all of our families that continue to support us every day. 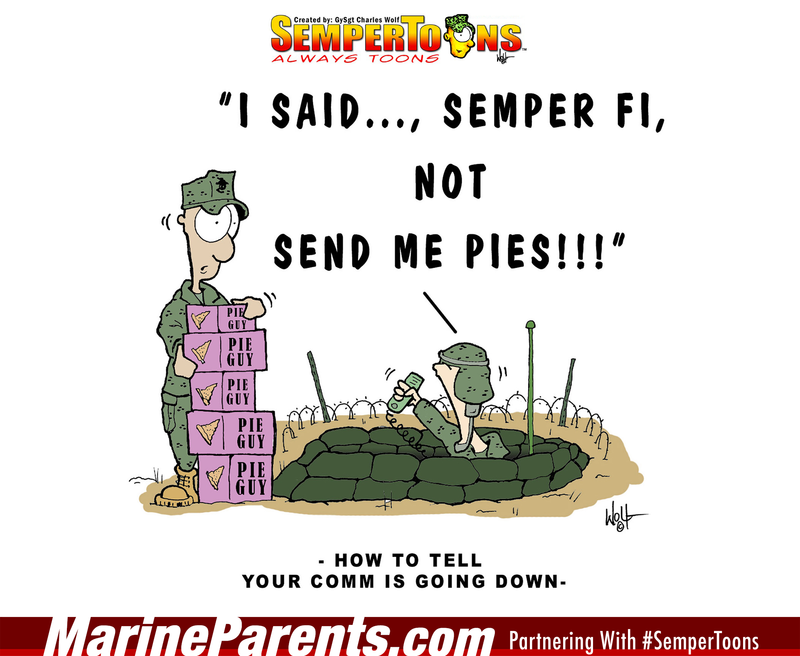 Semper Thanks!" 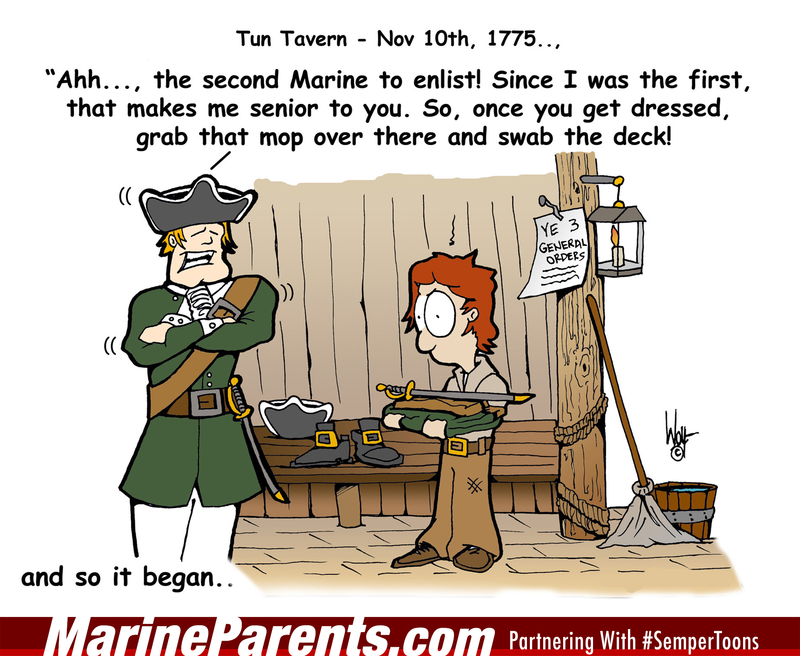 243 Years of Ooh Rah And Cake! 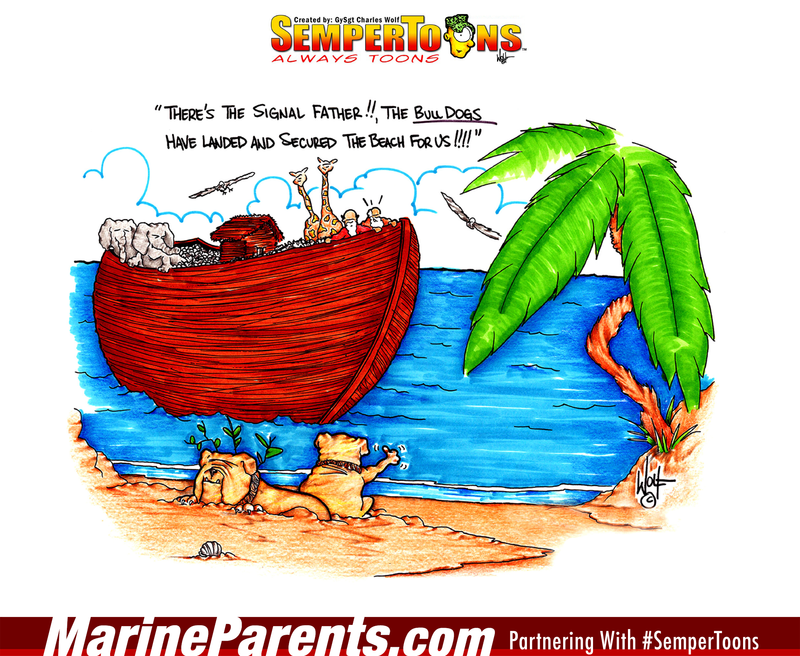 Gunny Wolf from SemperToons has created this Happy 243rd Marine Corps Birthday message to share with all Marines and their family members. 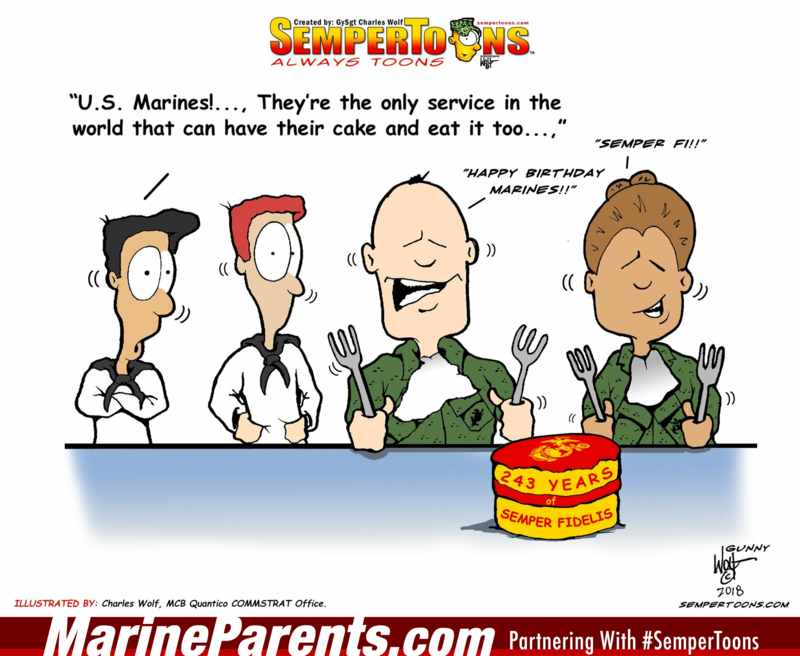 Marines can have their cake and eat it too! 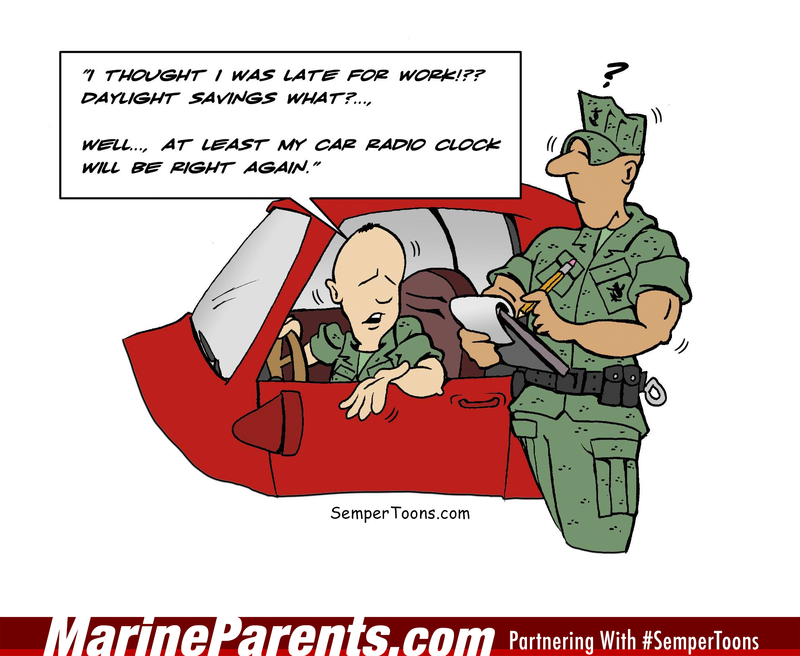 "I thought I was late for work!??" 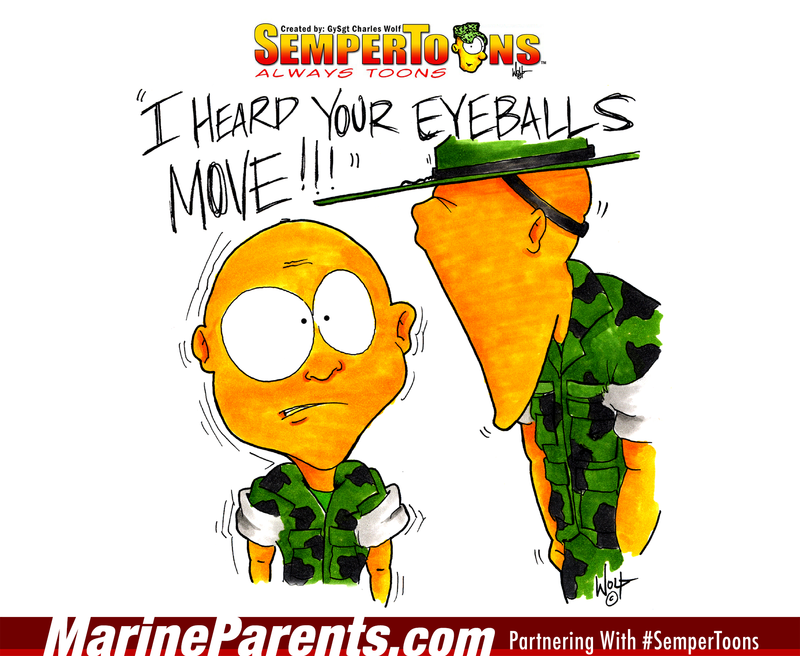 What recruit parent has not stalked the mailman? 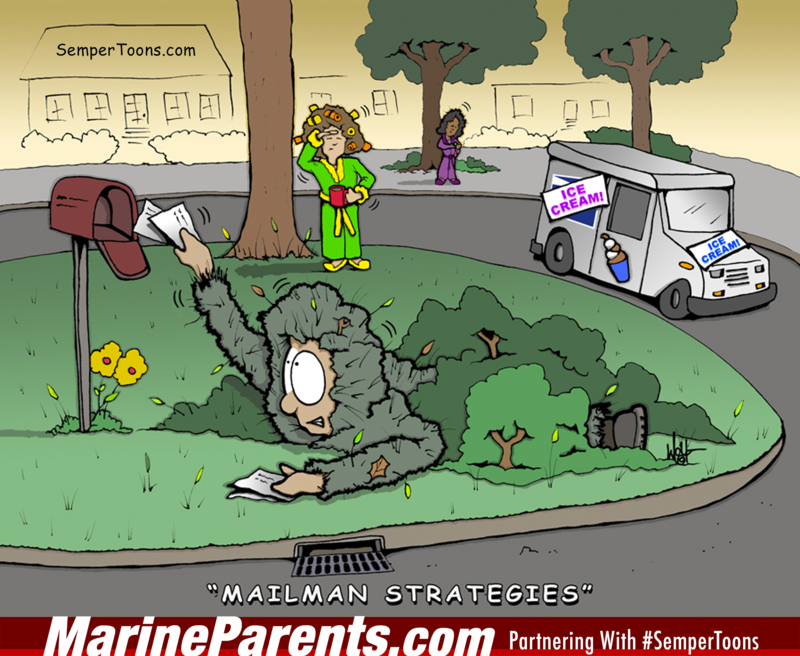 Gunny Wolf from SemperToons has created this rendition of mailman stalking created specifically for MarineParents.com. 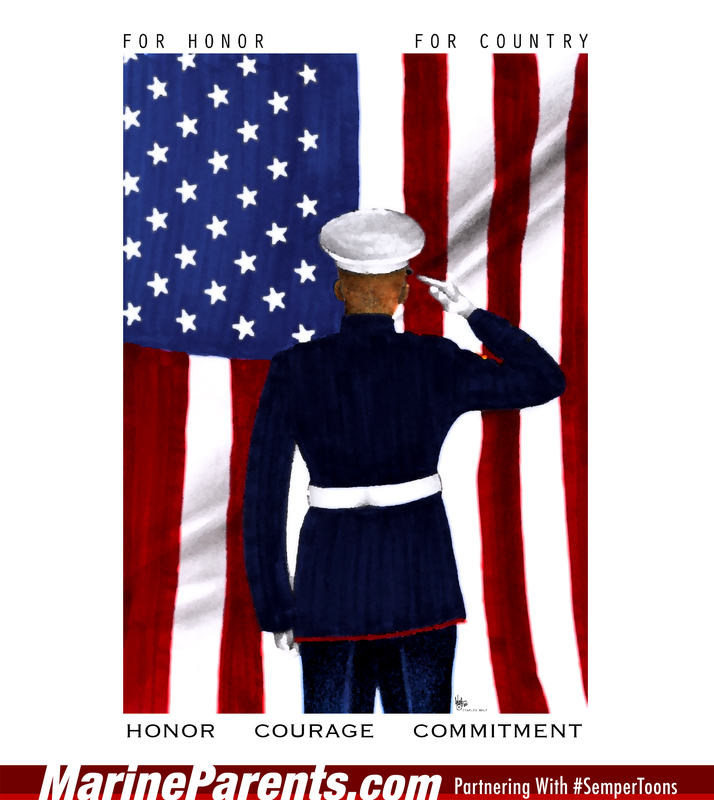 The postal carrier is in a gilly suit to deliver the mail and has even comouflaged his postal truck to look like an icecream truck while recruit mom scans the neighborhood for the mail truck and delivery.